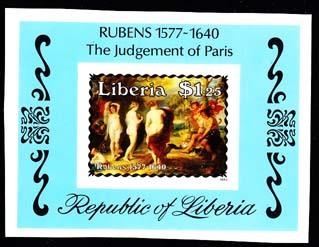 1260 EP LIBERIA (1906) Flag*. Proof pair in unissued colors printed on heavy paper stock. Scott No 109, Yvert No 92. 16567 EP LIBERIA (1954) Medical examination*. 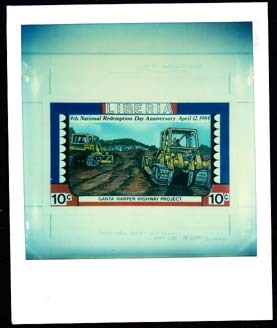 Imperforate proof missing color red. Scott No CB6, Yvert No PA75. 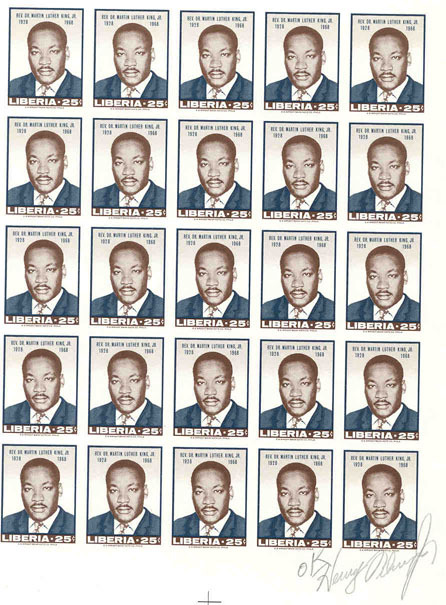 9754 EP LIBERIA (1968) Martin Luther King, Jr.* Full proof sheet of 25 (187 x 225 mm) with approval signature "OK". Scott No 481, Yvert No 458. 10847 EP LIBERIA (1970) Napoleon as Consul by Vien. 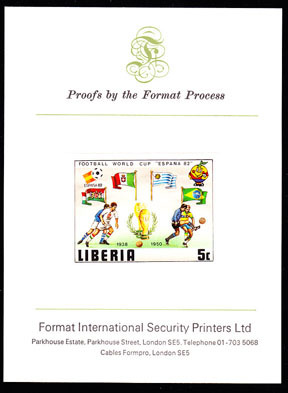 Imperforate proof mounted on Format International Security Printers card. Scott No 525, Yvert No 499. 10848 EP LIBERIA (1970) Napoleon visits school. 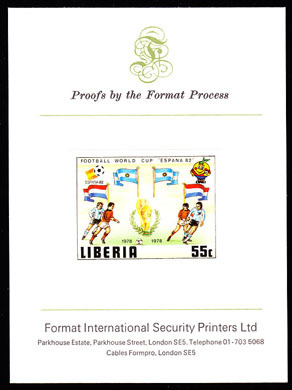 Imperforate proof mounted on Format International Security Printers card. Scott No 526, Yvert No 500. 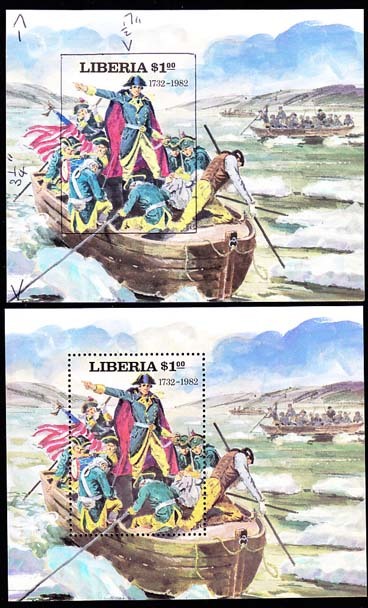 10849 EP LIBERIA (1970) Napoleon Bonaparte by Gerard. 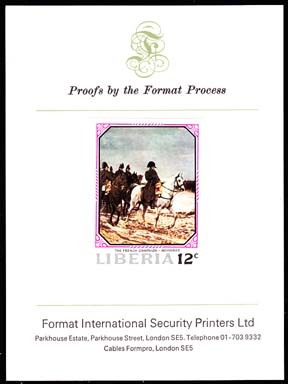 Imperforate proof mounted on Format International Security Printers card. Scott No 527, Yvert No 501. 10850 EP LIBERIA (1970) The French Campaign by Messonier. 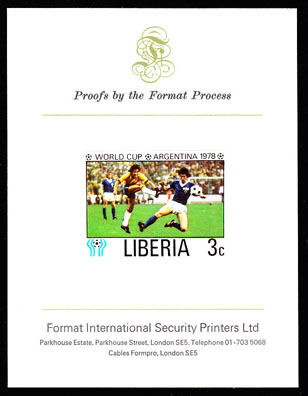 Imperforate proof mounted on Format International Security Printers card. Scott No 528, Yvert No 502. 10851 EP LIBERIA (1970) Napoleon signing abdication by Bouchot. 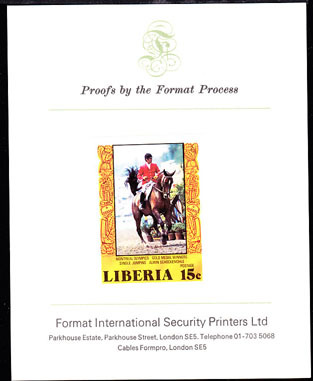 Imperforate proof mounted on Format International Security Printers card. Scott No 529, Yvert No 503. 10853 EP LIBERIA (1970) Coronation of Napoleon by David. 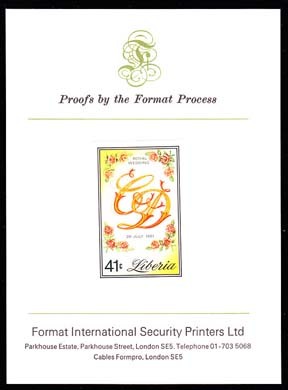 Imperforate proof of S/S mounted on Format International Security Printers card. Scott No 531, Yvert No BF50. 10580 EP LIBERIA (1971) Bapendé mask. 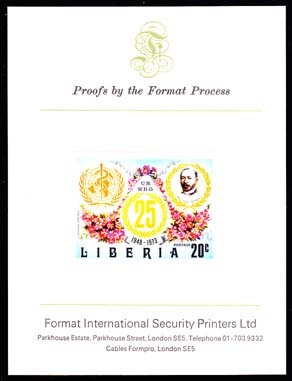 Imperforate proof mounted on Format International Security Printers card. Scott No 541, Yvert No 512. African Tribal Ceremonial Masks. 10581 EP LIBERIA (1971) Dogon mask. 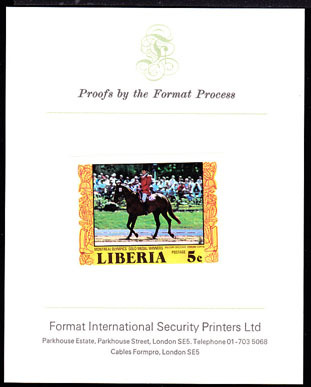 Imperforate proof mounted on Format International Security Printers card. Scott No 542, Yvert No 513. African Tribal Ceremonial Masks. 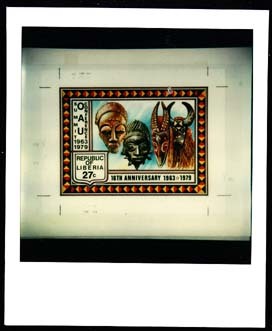 10582 EP LIBERIA (1971) Baoulé mask. 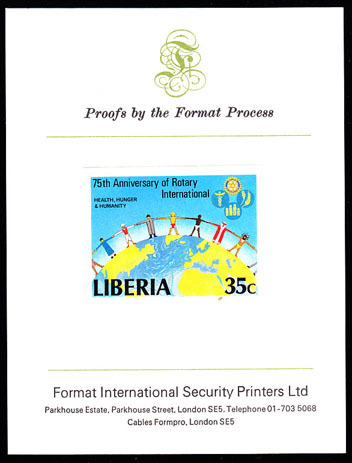 Imperforate proof mounted on Format International Security Printers card. Scott No 543, Yvert No 514. African Tribal Ceremonial Masks. 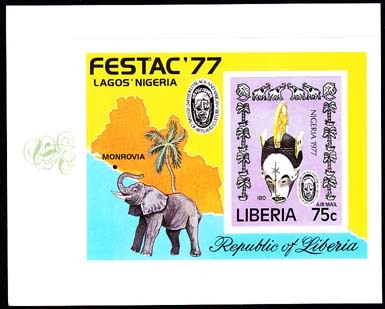 10583 EP LIBERIA (1971) Dégougou mask. 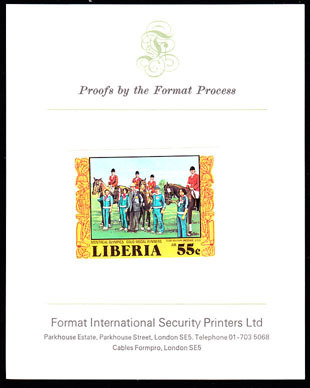 Imperforate proof mounted on Format International Security Printers card. Scott No 544, Yvert No 515. African Tribal Ceremonial Masks. 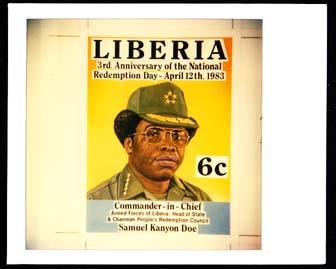 10584 EP LIBERIA (1971) Dan mask. 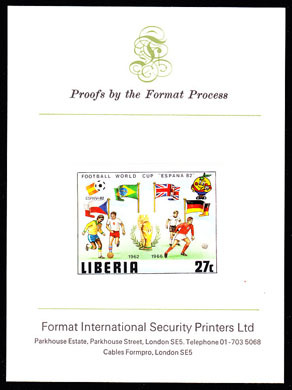 Imperforate proof mounted on Format International Security Printers card. Scott No 545, Yvert No 516. African Tribal Ceremonial Masks. 10585 EP LIBERIA (1971) Bamiléké mask. 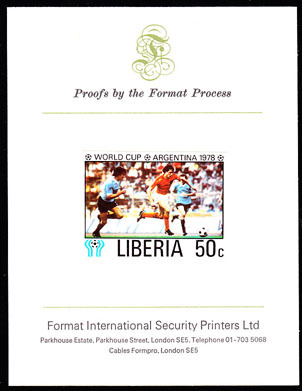 Imperforate proof mounted on Format International Security Printers card. Scott No 546, Yvert No 517. African Tribal Ceremonial Masks. 10586 EP LIBERIA (1971) Bamiléké mask and costume. 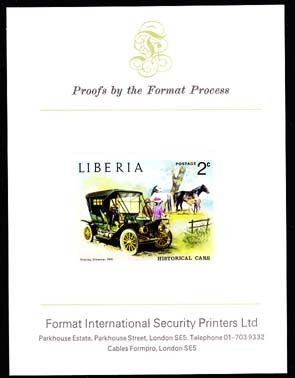 Imperforate proof mounted on Format International Security Printers card. Scott No 548, Yvert No 519. African Tribal Ceremonial Masks. 10587 EP LIBERIA (1971) Bapendé mask. 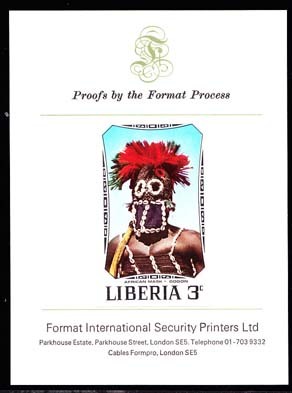 Imperforate proof mounted on Format International Security Printers card. Scott No 547, Yvert No 518. African Tribal Ceremonial Masks. 11391 EP LIBERIA (1971) Hall of Honor. Cyclists. 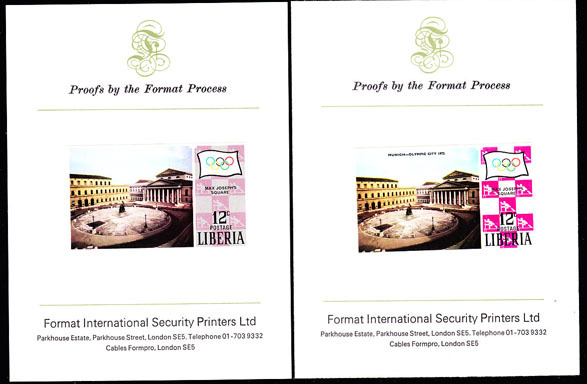 Set of 2 imperforate proofs mounted on card from Format International Security Printers, consisting of an unaccepted proof on the left with background too dark and no inscription above the building, alongside the accepted proof. Scott No 557, Yvert No 528. Munich Olympics. 11392 EP LIBERIA (1971) View of Munich. Soccer players. 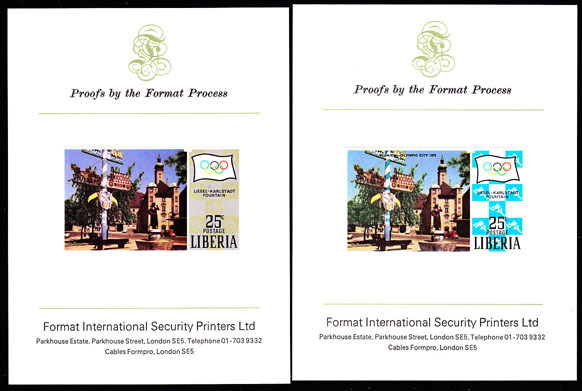 Set of 2 imperforate proofs mounted on card from Format International Security Printers, consisting of an unaccepted proof on the left with background too dark and no inscription above the building, alongside the accepted proof. Scott No 558, Yvert No 529. Munich Olympics. 11393 EP LIBERIA (1971) National Museum. Wrestlers. 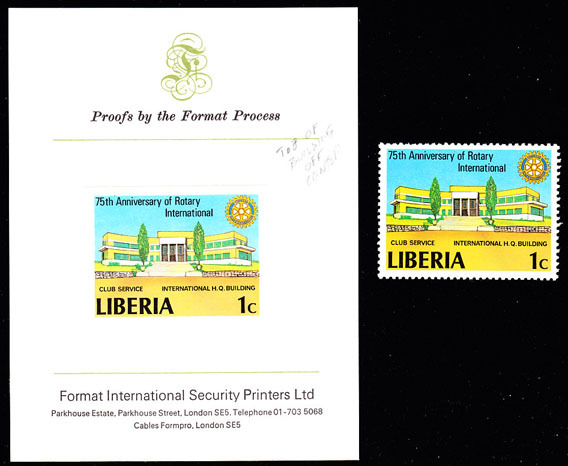 Set of 2 imperforate proofs mounted on card from Format International Security Printers, consisting of an unaccepted proof on the left with background too dark and no inscription above the building, alongside the accepted proof. Scott No 559, Yvert No 530. Munich Olympics. 11394 EP LIBERIA (1971) Max Josephs Square. Kayaker. 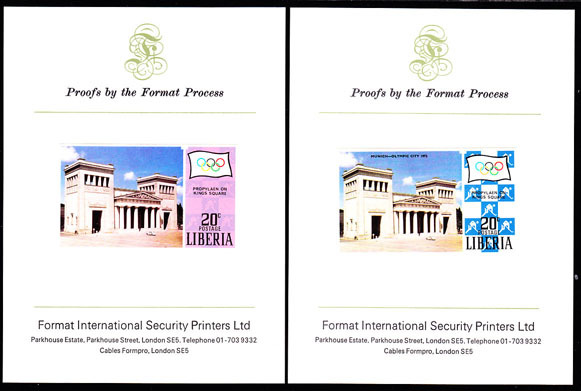 Set of 2 imperforate proofs mounted on card from Format International Security Printers, consisting of an unaccepted proof on the left with background too dark and no inscription above the building, alongside the accepted proof.] Scott No 560, Yvert No 531. Munich Olympics. 11395 EP LIBERIA (1971) Propylaen on Kings Square. Field Hockey. 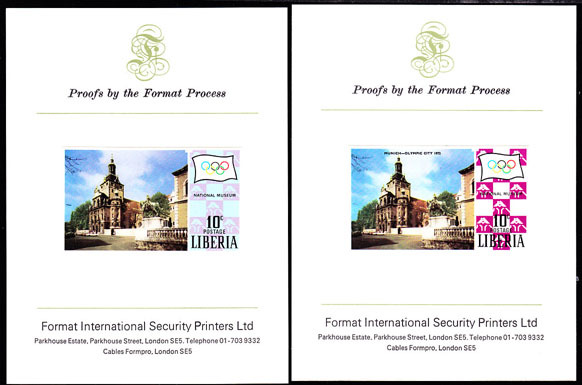 Set of 2 imperforate proofs mounted on card from Format International Security Printers, consisting of an unaccepted proof on the left with background too dark and no inscription above the building, alongside the accepted proof. Scott No 561, Yvert No 532. Munich Olympics. 11396 EP LIBERIA (1971) Liesel-Karlstadt Fountain. Runner. 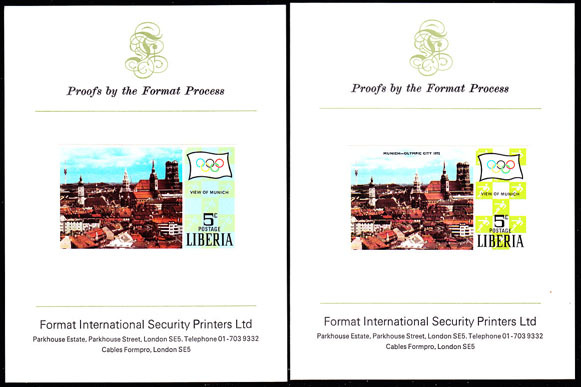 Set of 2 imperforate proofs mounted on card from Format International Security Printers, consisting of an unaccepted proof on the left with background too dark and no inscription above the building, alongside the accepted proof. Scott No 562, Yvert No 533. Munich Olympics. 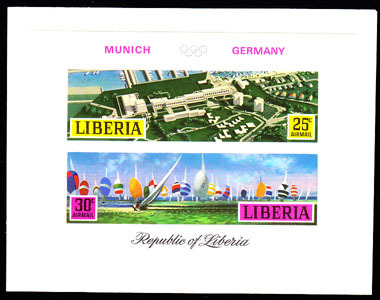 11399 EP LIBERIA (1971) Olympic Village. Regatta. Imperforate proof of S/S mounted on card from Format International Security Printers. Scott No C187, Yvert No BF54. Munich Olympics. 11919 EP LIBERIA (1972) Inauguration of President Tolbert. 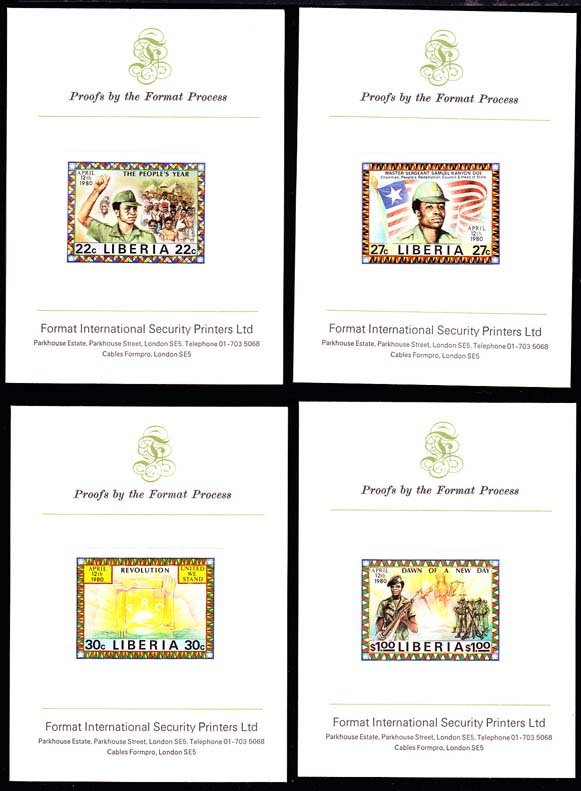 Set of 3 imperforate proofs mounted on Format International Security Printers card. Scott Nos 614-5,C195. Yvert Nos 585-6,BF62. 9475 EP LIBERIA (1973) 1910 Stanley Steamer. Horses. 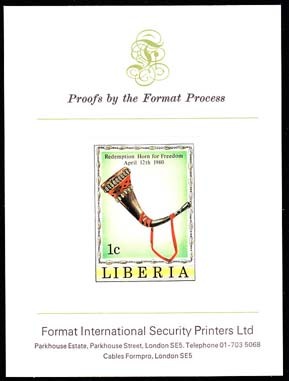 Imperforate proof mounted on Format International Security Printers card. Scott No 647, Yvert No 617. Historical cars series. 9476 EP LIBERIA (1973) 1903 Cadillac Model A. Picnic. 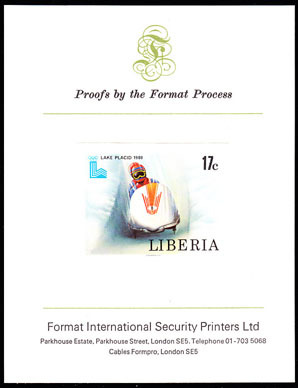 Imperforate proof mounted on Format International Security Printers card. Scott No 648, Yvert No 618. Historical cars series. 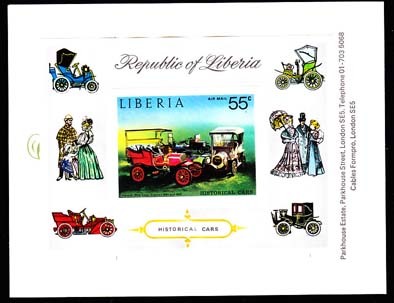 9477 EP LIBERIA (1973) 1904 Clement-Bayard. Sunset. 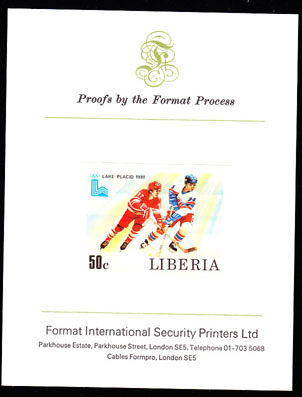 Imperforate proof mounted on Format International Security Printers card. Scott No 649, Yvert No 619. Historical cars series. 9478 EP LIBERIA (1973) 1907 Rolls-Royce Silver Ghost Tourer. Men & Women in fancy clothes. 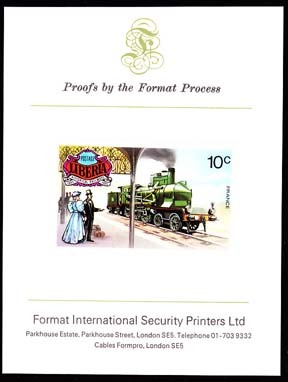 Imperforate proof mounted on Format International Security Printers card. Scott No 650, Yvert No 620. Historical cars series. 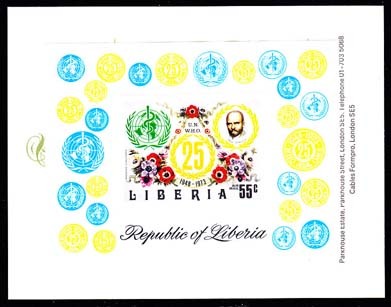 9479 EP LIBERIA (1973) 1907 Chadwick. Winter scene. 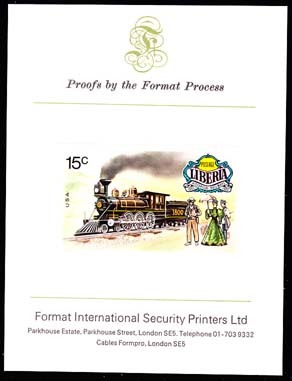 Imperforate proof mounted on Format International Security Printers card. Scott No 651, Yvert No 621. Historical cars series. 9480 EP LIBERIA (1973) 1905 Maxwell Gentlemen's Speedster. Horse. 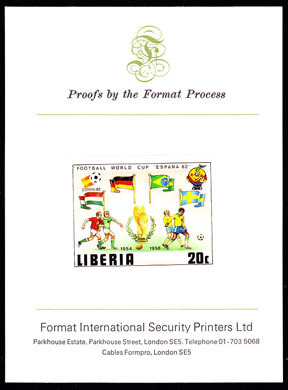 Imperforate proof mounted on Format International Security Printers card. Scott No 652, Yvert No 622. Historical cars series. 9481 EP LIBERIA (1973) 1904-5 Franklin 10 HP cross-engined. 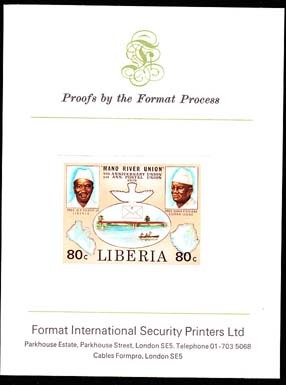 Imperforate proof of S/S mounted on Format International Security Printers card. Scott No C199, Yvert No BF67. Historical cars series. 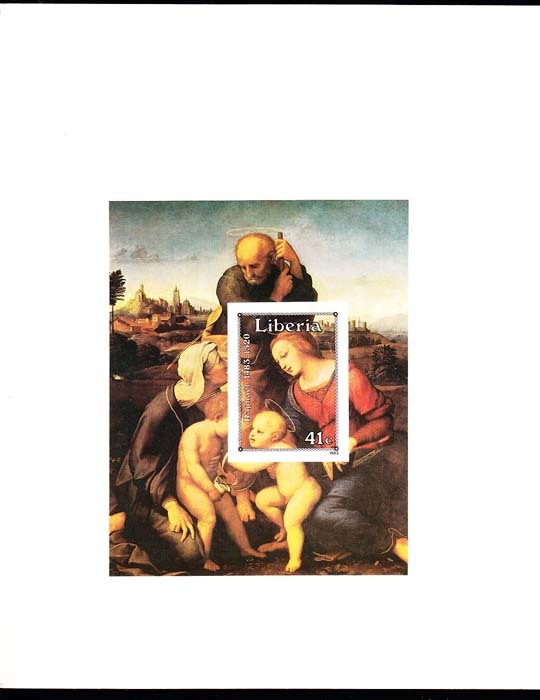 10644 EP LIBERIA (1973) WHO emblem. Jenner. Roses. 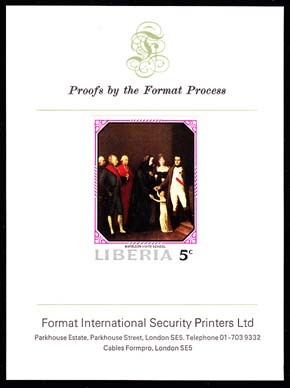 Imperforate proof mounted on Format International Security Printers card. Scott No 641, Yvert No 611. 25th anniversary of WHO. 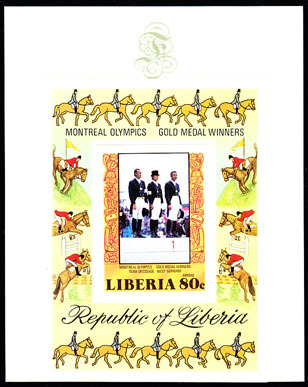 10645 EP LIBERIA (1973) WHO emblem. Freud. Pansies. 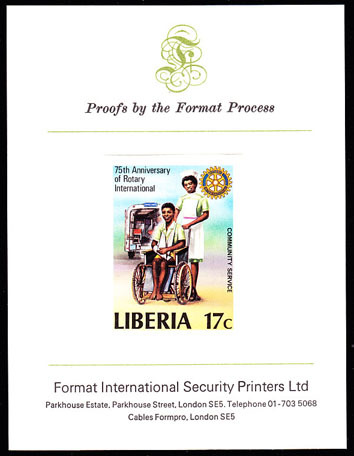 Imperforate proof mounted on Format International Security Printers card. Scott No 642, Yvert No 612. 25th anniversary of WHO. 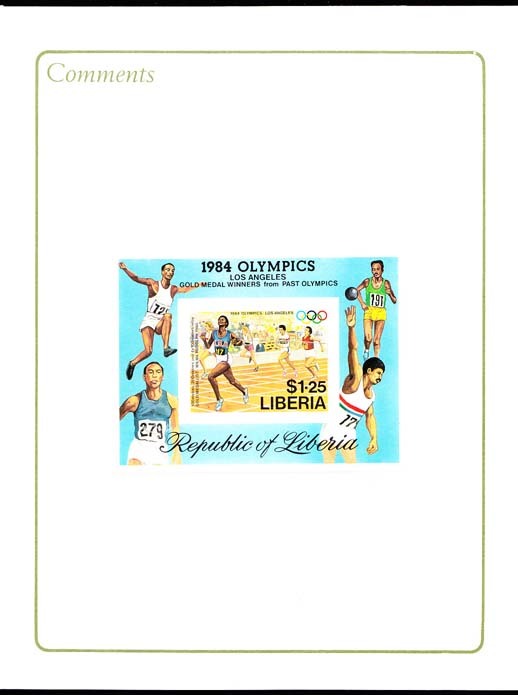 10646 EP LIBERIA (1973) WHO emblem. Salk. Chrysanthemums. 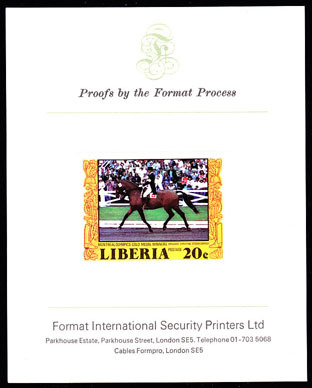 Imperforate proof mounted on Format International Security Printers card. Scott No 643, Yvert No 613. 25th anniversary of WHO. 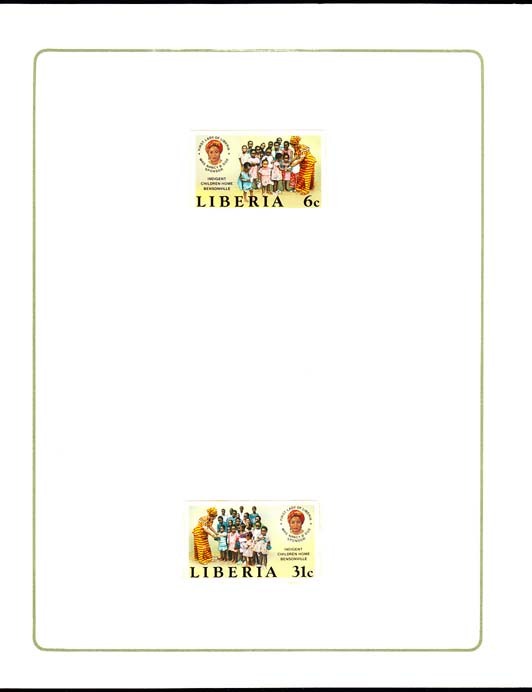 10647 EP LIBERIA (1973) WHO emblem. Pasteur. Scabiosa caucasica. 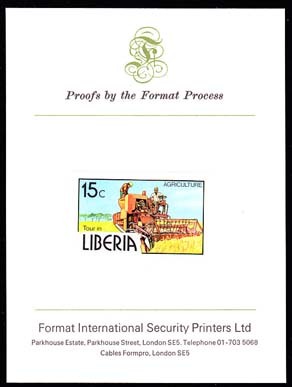 Imperforate proof mounted on Format International Security Printers card. Scott No 644, Yvert No 614. 25th anniversary of WHO. 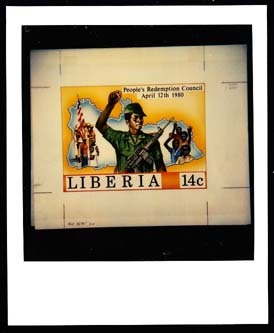 10648 EP LIBERIA (1973) WHO emblem. von Behring. Rhododendron. 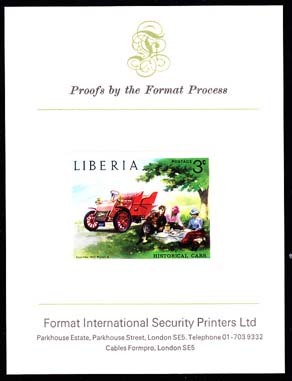 Imperforate proof mounted on Format International Security Printers card. Scott No 645, Yvert No 615. 25th anniversary of WHO. 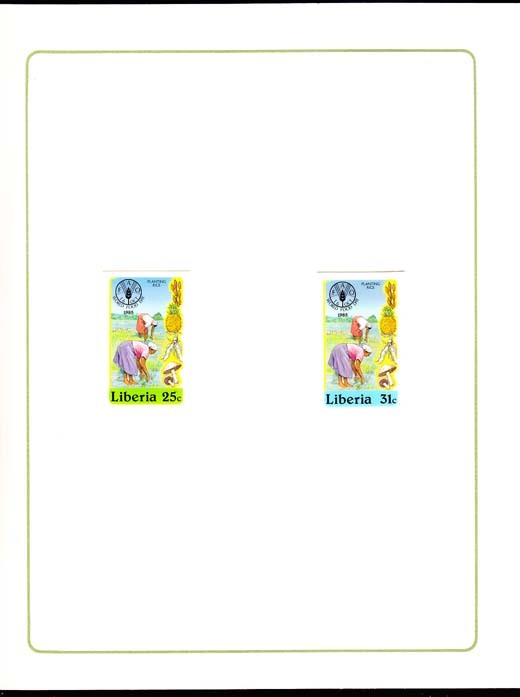 10649 EP LIBERIA (1973) WHO emblem. Fleming. Tree mallows. 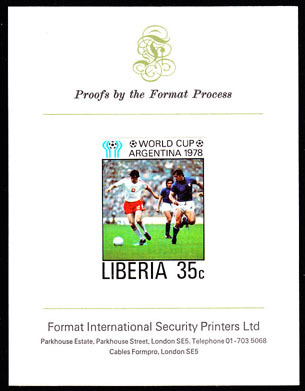 Imperforate proof mounted on Format International Security Printers card. Scott No 646, Yvert No 616. 25th anniversary of WHO. 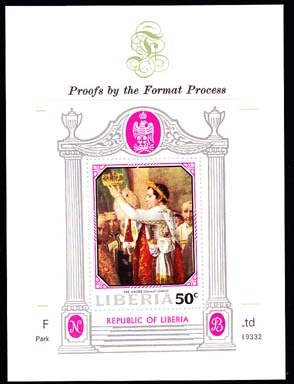 10650 EP LIBERIA (1973) WHO emblem. Ehrlich. Poppy anemones. 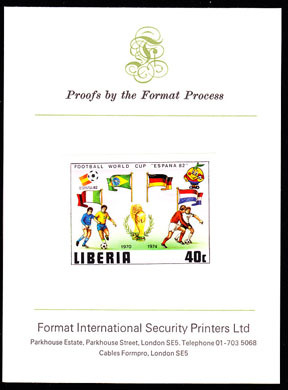 Imperforate proof mounted on Format International Security Printers card. Scott No C197, Yvert No BF66. 25th anniversary of WHO. 11661 EP LIBERIA (1973) English locomotive. Imperforate proof mounted on Format International Security Printers card. Scott No 629, Yvert No 599. 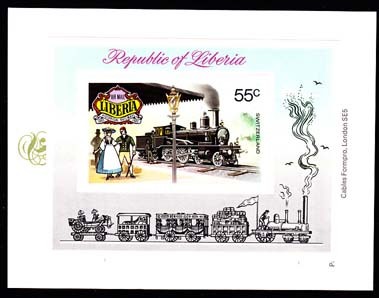 11662 EP LIBERIA (1973) Dutch locomotive. 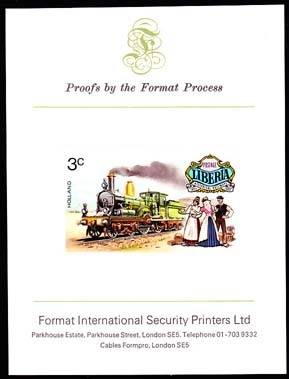 Imperforate proof mounted on Format International Security Printers card. Scott No 630, Yvert No 600. 11663 EP LIBERIA (1973) French locomotive. 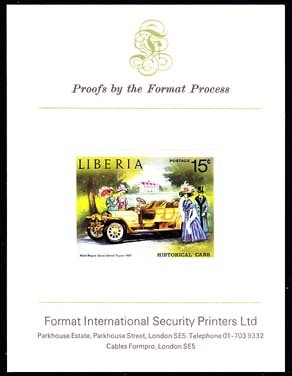 Imperforate proof mounted on Format International Security Printers card. Scott No 631, Yvert No 601. 11664 EP LIBERIA (1973) U.S. locomotive. 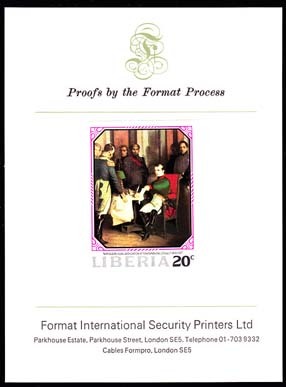 Imperforate proof mounted on Format International Security Printers card. Scott No 632, Yvert No 602. 11666 EP LIBERIA (1973) German locomotive. 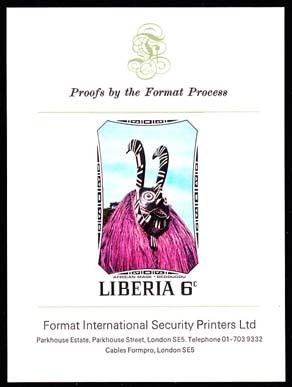 Imperforate proof mounted on Format International Security Printers card. Scott No 634, Yvert No 604. 11667 EP LIBERIA (1973) Swiss locomotive. 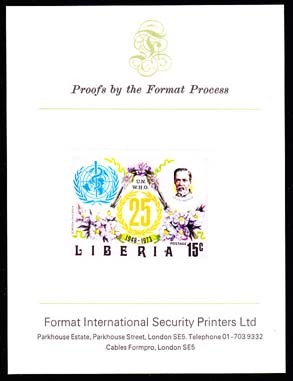 Imperforate proof of S/S mounted on Format International Security Printers card. Scott No C197, Yvert No BF65. 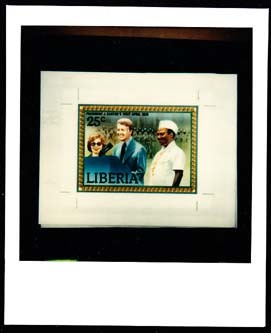 11856 EP LIBERIA (1975) President Tolbert. President Stevens. Maps of Sierra Leone, Liberia. 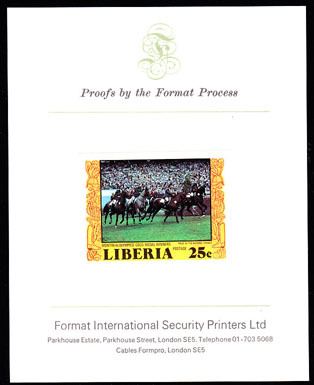 Imperforate proof mounted on Format International Security Printers card. Scott No 726, Yvert No 696. Mano River Union. 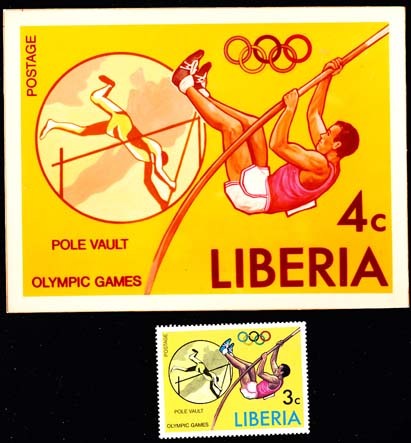 11415 EP LIBERIA (1976) Pole vault*. Preliminary photo proof, measuring 13 x 10 cm. Montreal Olympics. Scott No 737, Yvert No 707. The coloration and value were changed on the issued stamp (shown below in scan). 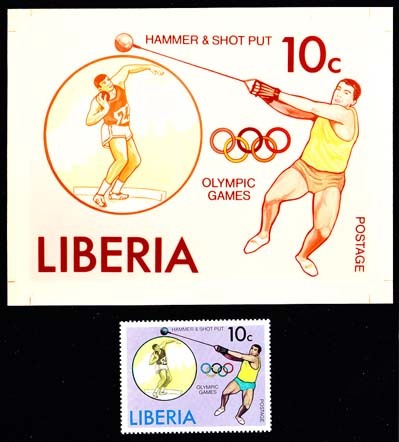 11416 EP LIBERIA (1976) Hammer and shot put*. Preliminary photo proof, measuring 13 x 10 cm. Montreal Olympics. Scott No 738, Yvert No 708. The coloration was changed on the issued stamp (shown below in scan). 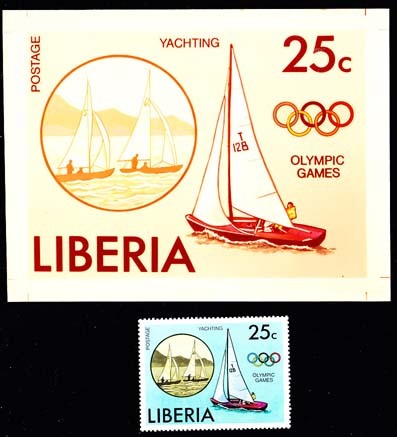 11417 EP LIBERIA (1976) Yachting*. Preliminary photo proof, measuring 13 x 10 cm. Montreal Olympics. Scott No 739, Yvert No 709. The coloration was changed on the issued stamp (shown below in scan). 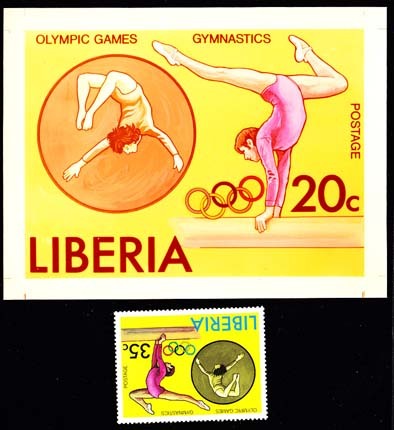 11418 EP LIBERIA (1976) Gymnastics*. Preliminary photo proof, measuring 13 x 10 cm. Montreal Olympics. Scott No 740, Yvert No 710. The coloration and value were changed on the issued stamp (shown below in scan). 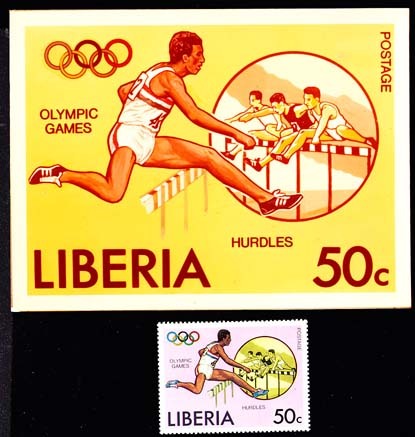 11419 EP LIBERIA (1976) Hurdles*. Preliminary photo proof, measuring 13 x 10 cm. Montreal Olympics. Scott No 741, Yvert No 711. The coloration was changed on the issued stamp (shown below in scan). 11420 EP LIBERIA (1976) Edmund Coffin - military dressage. Imperforate proof mounted on card from Format International Security Printers. Scott No 784, Yvert No 742. Equestrian gold medal winners at Montreal Olympics. 11421 EP LIBERIA (1976) Alwyn Schockemohle - single jumping. Imperforate proof mounted on card from Format International Security Printers. Scott No 785, Yvert No 743. Equestrian gold medal winners at Montreal Olympics. 11422 EP LIBERIA (1976) Christine Stuckelberger - dressage. Imperforate proof mounted on card from Format International Security Printers. Scott No 786, Yvert No 744. Equestrian gold medal winners at Montreal Olympics. 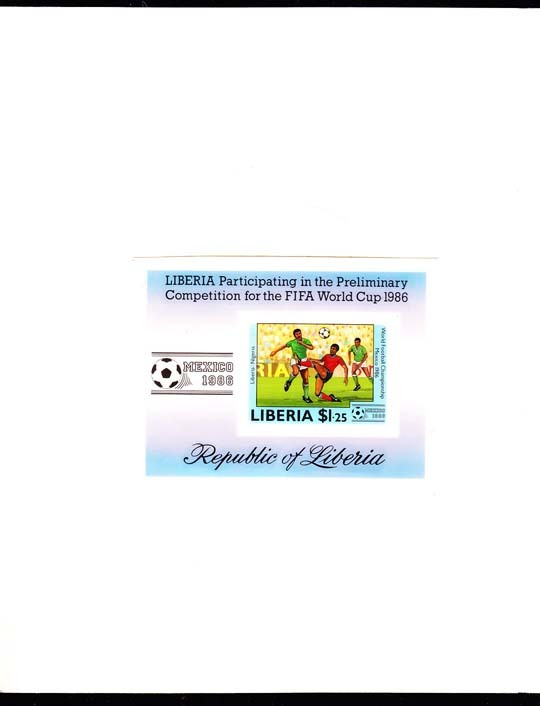 11423 EP LIBERIA (1976) France - prize of the nations. Imperforate proof mounted on card from Format International Security Printers. Scott No 787, Yvert No 745. Equestrian gold medal winners at Montreal Olympics. 11434 EP LIBERIA (1976) USA - team military dressage. Imperforate proof mounted on card from Format International Security Printers. Scott No C216, Yvert No PA156. Equestrian gold medal winners at Montreal Olympics. 11435 EP LIBERIA (1976) West Germany - team dressage. Imperforate proof of S/S mounted on card from Format International Security Printers. Scott No C217, Yvert No BF85. Equestrian gold medal winners at Montreal Olympics. 9766 EP LIBERIA (1977) Mano river bridge. 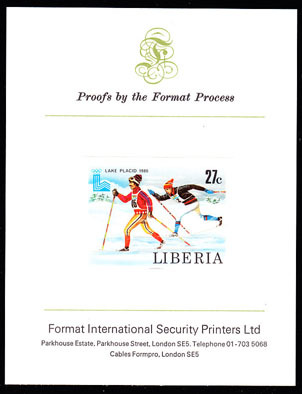 Imperforate proof mounted on Format International Security Printers card. Scott No 750, Yvert No 749. 10168 EP LIBERIA (1977) Barracuda. Lake Piso. 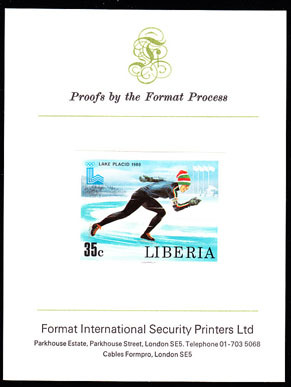 Imperforate proof mounted on Format International Security Printers card. Scott No 759, Yvert No 750. 10589 EP LIBERIA (1977) Baluba mask. 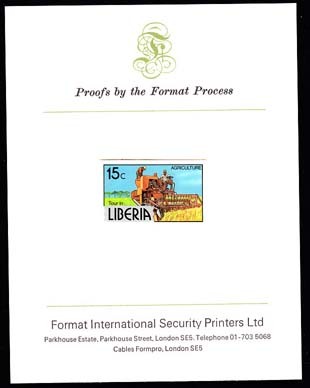 Imperforate proof mounted on Format International Security Printers card. Scott No 771, Yvert No 730. 2nd World Black and African Festival. 10590 EP LIBERIA (1977) Bateke mask. 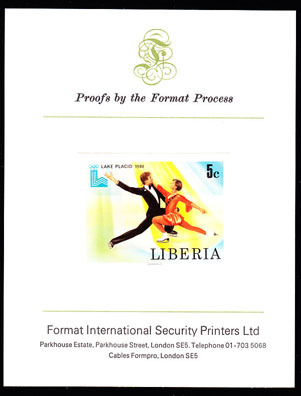 Imperforate proof mounted on Format International Security Printers card. Scott No 772, Yvert No 731. 2nd World Black and African Festival. 10591 EP LIBERIA (1977) Basshilele mask. 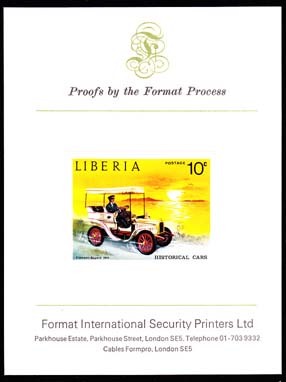 Imperforate proof mounted on Format International Security Printers card. Scott No 773, Yvert No 732. 2nd World Black and African Festival. 10592 EP LIBERIA (1977) Igungun mask. 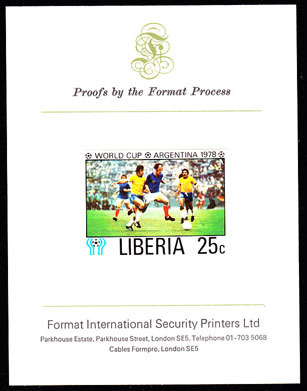 Imperforate proof mounted on Format International Security Printers card. Scott No 774, Yvert No 733. 2nd World Black and African Festival. 10593 EP LIBERIA (1977) Masai mask. Elephants. 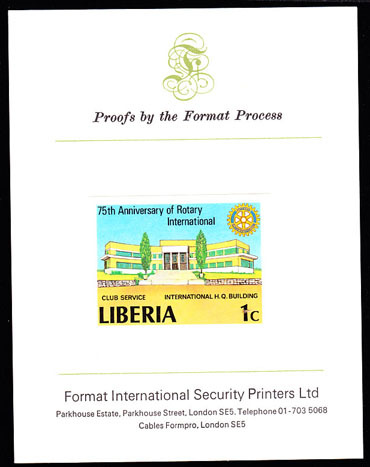 Imperforate proof mounted on Format International Security Printers card. Scott No 775, Yvert No 734. 2nd World Black and African Festival. 10594 EP LIBERIA (1977) Kifwebe mask. 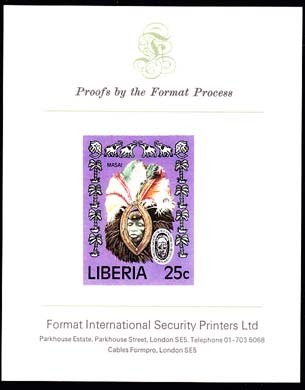 Elephants Imperforate proof mounted on Format International Security Printers card. Scott No 776, Yvert No 735. 2nd World Black and African Festival. 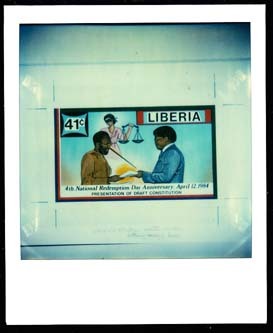 10595 EP LIBERIA (1977) Ibo mask. Elephants. Map of Liberia. 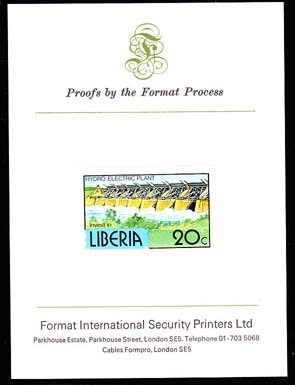 Imperforate proof of S/S mounted on Format International Security Printers card. Scott No C215, Yvert No BF83. 2nd World Black and African Festival. 11491 EP LIBERIA (1978) Argentina World Cup - Poland vs. Argentina. 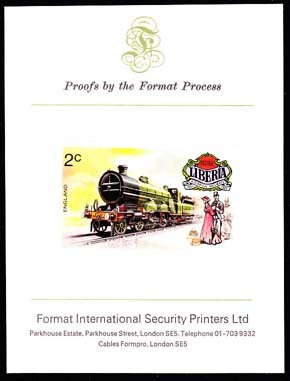 Imperforate proof mounted on card from Format International Security Printers. Scott No 807, Yvert No 766. 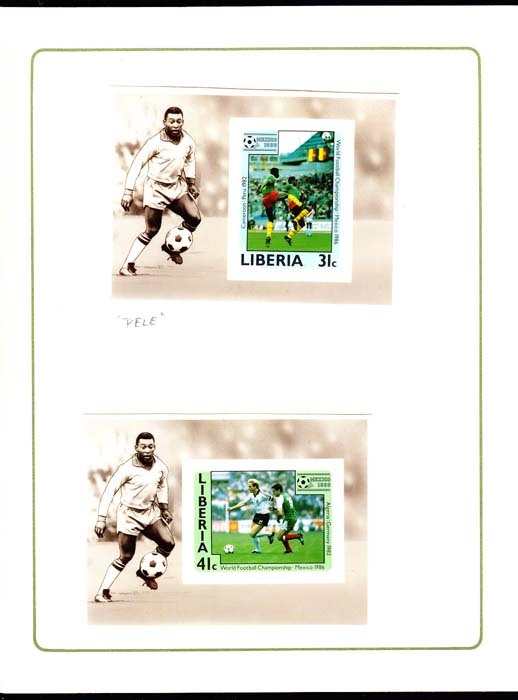 11492 EP LIBERIA (1978) Argentina World Cup - East Germany vs. Brazil. Imperforate proof mounted on card from Format International Security Printers. Scott No 808, Yvert No 767. 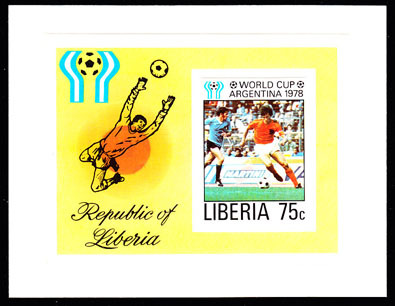 11493 EP LIBERIA (1978) Argentina World Cup - West Germany vs. Netherlands. Imperforate proof mounted on card from Format International Security Printers. Scott No 809, Yvert No 768. 11494 EP LIBERIA (1978) Argentina World Cup - Yugoslavia vs. Brazil. Imperforate proof mounted on card from Format International Security Printers. Scott No 810, Yvert No 769. 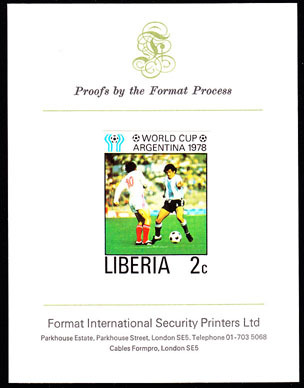 11495 EP LIBERIA (1978) Argentina World Cup - Poland vs. Italy. Imperforate proof mounted on card from Format International Security Printers. Scott No 811, Yvert No 770. 11496 EP LIBERIA (1978) Argentina World Cup - Netherlands vs. Uruguay. Imperforate proof mounted on card from Format International Security Printers. Scott No 812, Yvert No 771. 11498 EP LIBERIA (1978) Argentina World Cup - Netherlands vs. Uruguay. Imperforate proof of S/S mounted on card from Format International Security Printers. Scott No C220, Yvert No BF89. 11924 EP LIBERIA (1978) Jimmy Carter & family. President Tolbert. 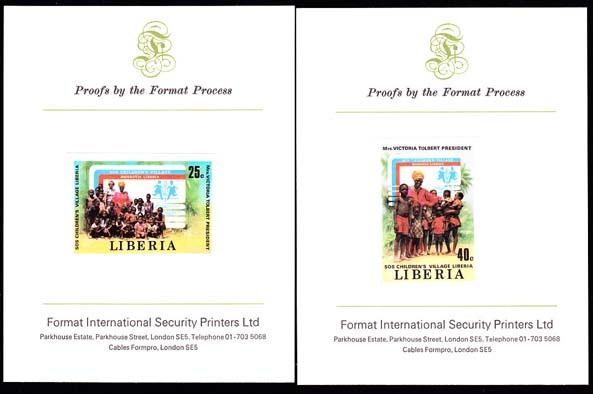 Set of 3 imperforate proofs mounted on Format International Security Printers card. Scott Nos 817-9, Yvert Nos 775-7. 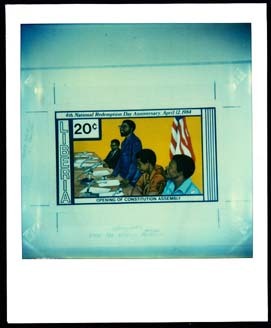 11925 EP LIBERIA (1978) President Carter's visit. Polaroid proof (See Note) of artwork. Scott No 817, Yvert No 775. 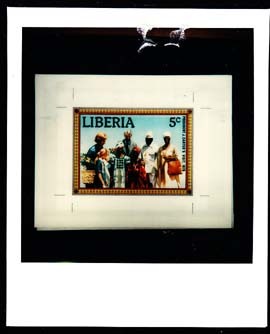 These proofs were Polaroid photographs of the original artwork that were sent by the printer (Format International) to the Liberian Philatelic Agency for their approval. 11926 EP LIBERIA (1978) President Carter's visit. Polaroid proof (See Note) of artwork. Scott No 818, Yvert No 776. 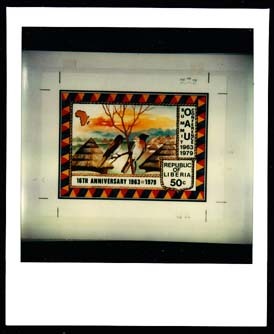 These proofs were Polaroid photographs of the original artwork that were sent by the printer (Format International) to the Liberian Philatelic Agency for their approval. 11927 EP LIBERIA (1978) "President Carter's visit. Polaroid proof (See Note) of artwork. Scott No 819, Yvert No 777. 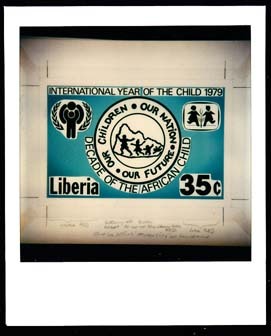 These proofs were Polaroid photographs of the original artwork that were sent by the printer (Format International) to the Liberian Philatelic Agency for their approval. 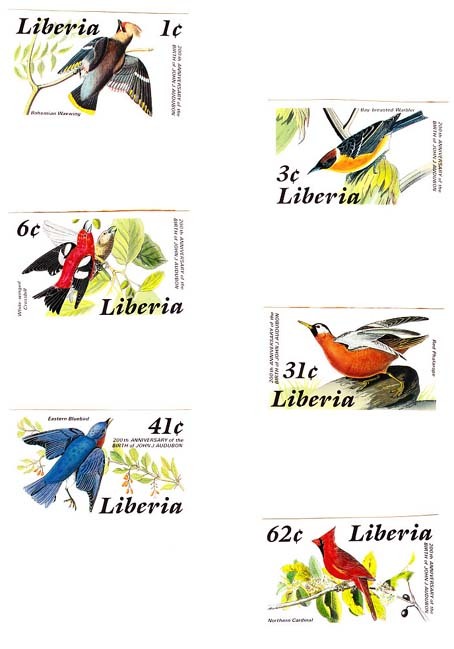 9678 EP LIBERIA (1979) Pepper birds. Huts. Map of Africa Polaroid proof (See Note) of artwork. Scott No 841, Yvert No 799. 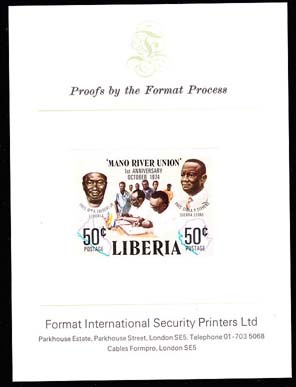 These proofs were Polaroid photographs of the original artwork that were sent by the printer (Format International) to the Liberian Philatelic Agency for their approval. 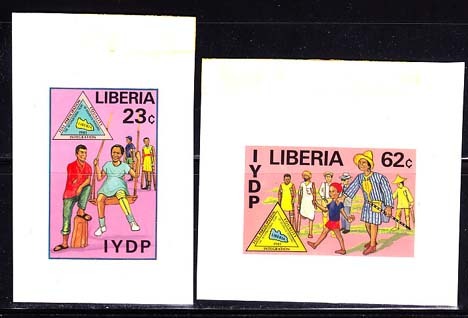 9884 EP LIBERIA (1979) IYC. Decade of African Child. Polaroid proof (See Note) of artwork. Scott No 832, Yvert No 790. 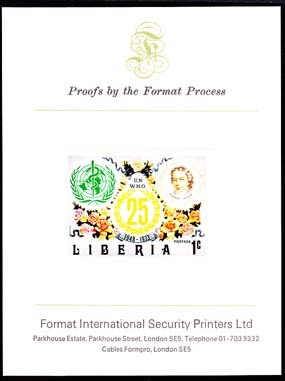 These proofs were Polaroid photographs of the original artwork that were sent by the printer (Format International) to the Liberian Philatelic Agency for their approval. Marginal notes refer to stamp and artwork size and note minor color changes. 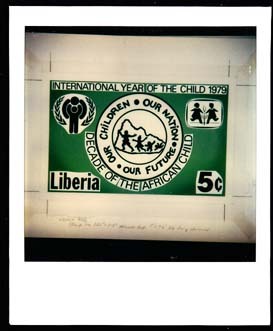 9885 EP LIBERIA (1979) IYC. Decade of African Child. Polaroid proof (See Note) of artwork. Scott No 833, Yvert No 791. 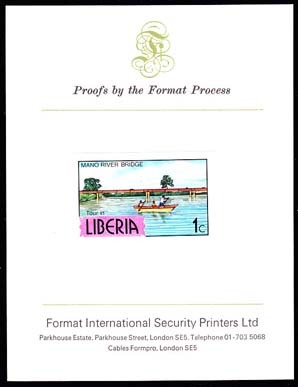 These proofs were Polaroid photographs of the original artwork that were sent by the printer (Format International) to the Liberian Philatelic Agency for their approval. 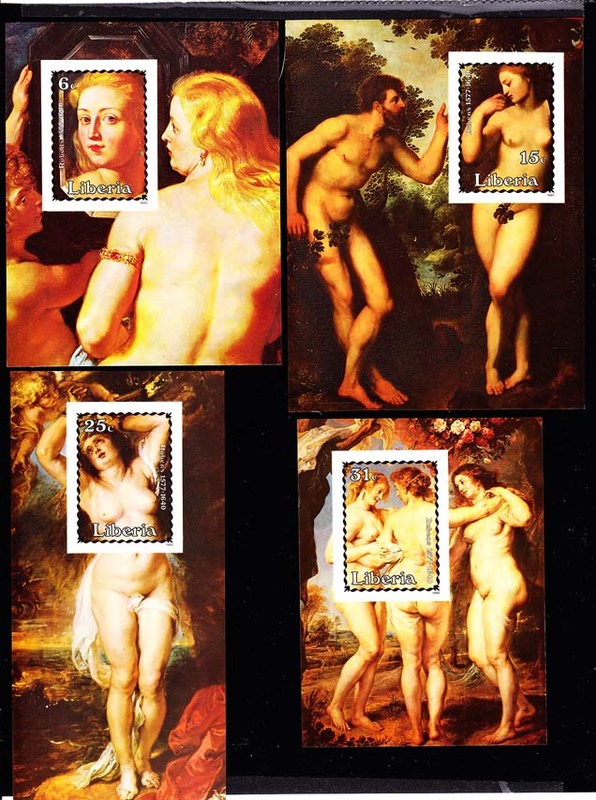 Marginal notes refer to stamp and artwork size and note minor color changes. 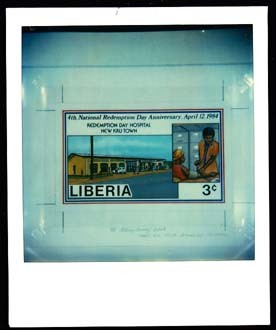 9886 EP LIBERIA (1979) IYC. Decade of African Child. Polaroid proof (See Note) of artwork. Scott No 834, Yvert No 792. 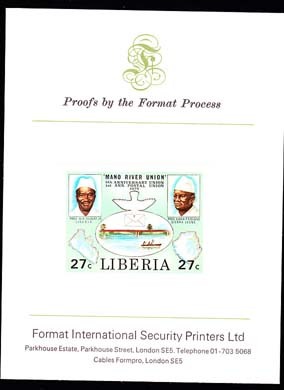 These proofs were Polaroid photographs of the original artwork that were sent by the printer (Format International) to the Liberian Philatelic Agency for their approval. Marginal notes refer to stamp and artwork size and note minor color changes. 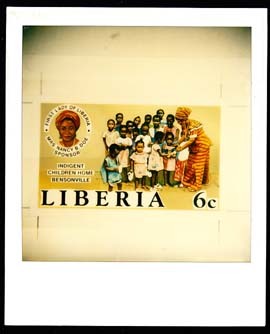 9887 EP LIBERIA (1979) IYC. Decade of African Child. Polaroid proof (See Note) of artwork. Scott No 835, Yvert No 793. 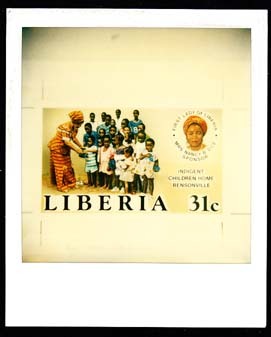 These proofs were Polaroid photographs of the original artwork that were sent by the printer (Format International) to the Liberian Philatelic Agency for their approval. Marginal notes refer to stamp and artwork size and note minor color changes. 9888 EP LIBERIA (1979) SOS Children's Village. 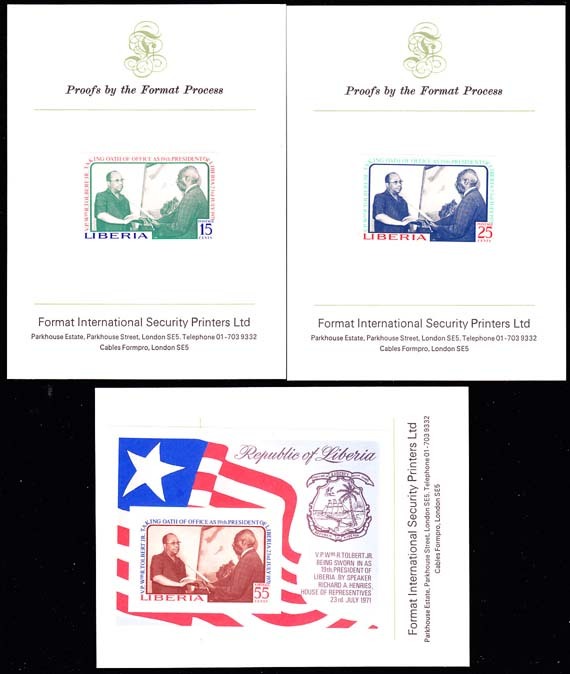 Set of 2 imperforate proofs mounted on Format International Security Printers card. Scott Nos 858-9, Yvert Nos 866-7. 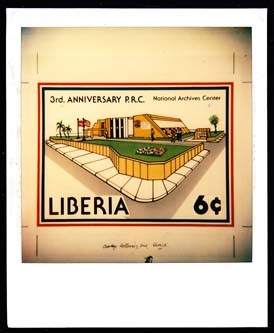 10378 EP LIBERIA (1979) Arms clasped in a square. Hand holding torch. Map of Africa. Polaroid proof (See Note) of artwork. Scott No 838, Yvert No 796. 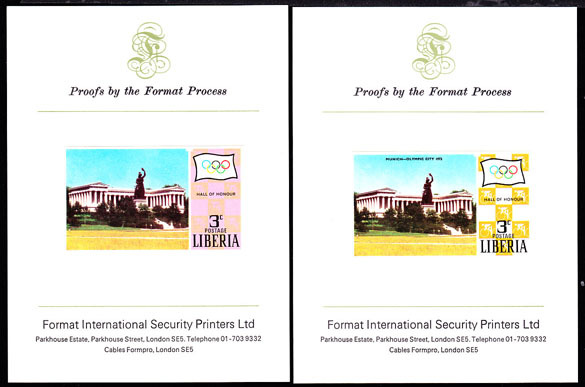 These proofs were Polaroid photographs of the original artwork that were sent by the printer (Format International) to the Liberian Philatelic Agency for their approval. 10596 EP LIBERIA (1979) Tribal masks. Polaroid proof (See Note) of artwork. Scott No 839, Yvert No 797. 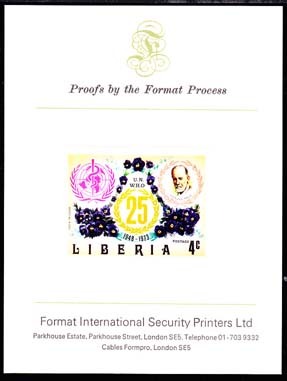 These proofs were Polaroid photographs of the original artwork that were sent by the printer (Format International) to the Liberian Philatelic Agency for their approval. 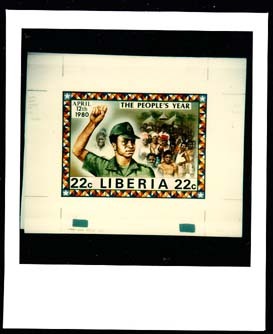 11034 EP LIBERIA (1979) "25". Radio waves. Polaroid proof (See Note) of artwork. 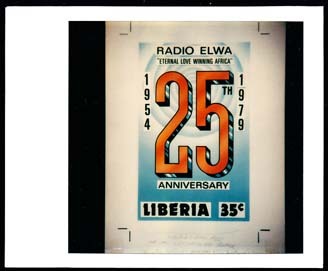 25th anniversary of Radio ELWA. Scott No 830, Yvert No 788. 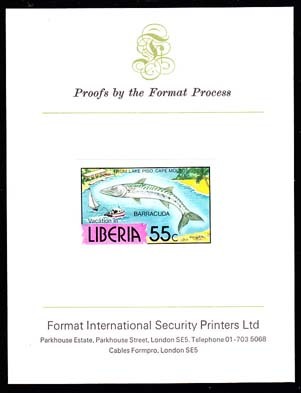 These proofs were Polaroid photographs of the original artwork that were sent by the printer (Format International) to the Liberian Philatelic Agency for their approval. 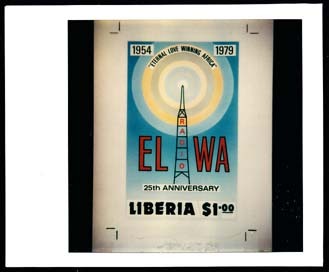 11035 EP LIBERIA (1979) Radio tower. Radio waves. Polaroid proof (See Note) of artwork. 25th anniversary of Radio ELWA. Scott No 831, Yvert No 789. 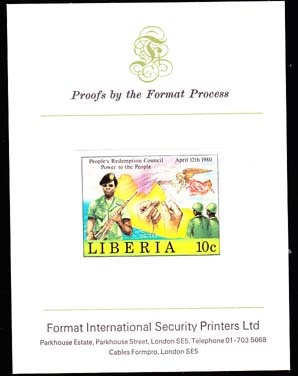 These proofs were Polaroid photographs of the original artwork that were sent by the printer (Format International) to the Liberian Philatelic Agency for their approval. 11127 EP LIBERIA (1979) Rotary headquarters. Imperforate proof mounted on card from Format International Security Printers. Scott No 860, Yvert No 860. 11128 EP LIBERIA (1979) Rotary headquarters. Preliminary imperforate proof mounted on card from Format International Security Printers. Scott No 860, Yvert No 860. Marginal note says "Top of building off center". Issued stamp shown for comparison (I cannot see any difference). 11129 EP LIBERIA (1979) Ambulance. Nurse. Boy in wheelchair. Community service. Preliminary imperforate proof mounted on card from Format International Security Printers. Scott No 862, Yvert No 862. Marginal note says "Preliminary proof". Issued stamp shown for comparison (View of ambulance changed, Different boy in wheelchair). 11130 EP LIBERIA (1979) Ambulance. Nurse. Boy in wheelchair. Community service. Imperforate proof mounted on card from Format International Security Printers. Scott No 862, Yvert No 862. 11131 EP LIBERIA (1979) Globe spanned by people with linked arms. Health, Hunger & Humanity. Imperforate proof mounted on card from Format International Security Printers. Scott No 864, Yvert No 864. 11132 EP LIBERIA (1979) Map of Africa. 75th anniversary. Imperforate proof mounted on card from Format International Security Printers. Scott No 865, Yvert No 865. 11133 EP LIBERIA (1979) Rotary emblem. Children. Preliminary imperforate proof mounted on card from Format International Security Printers. Scott No 866, Yvert No BF93. Marginal notes say "Heads too large. Move 'dot' of $1.00. Fill in teeth on boy in upper right". Issued proof of stamp shown for comparison (other minor changes were made). 9026 EP LIBERIA (1980) Harvester. 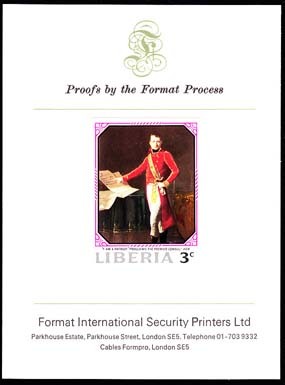 Imperforate proof mounted on Format International Security Printers card. Scott No 754, Yvert No 878. 10074 EP LIBERIA (1980) Hydro-electric plant. 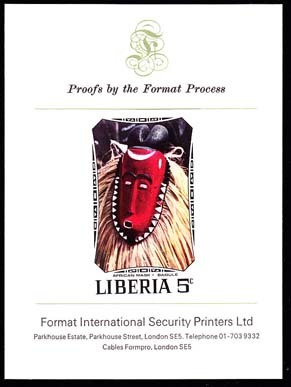 Imperforate proof mounted on Format International Security Printers card. Scott No 756, Yvert No 879. 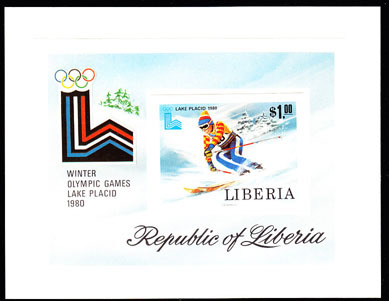 11469 EP LIBERIA (1980) Ski jump. Imperforate proof mounted on card from Format International Security Printers. Scott No 867, Yvert No 868. Lake Placid Olympics. 11470 EP LIBERIA (1980) Figure skating (pairs). Imperforate proof mounted on card from Format International Security Printers. Scott No 868, Yvert No 869. Lake Placid Olympics. 11471 EP LIBERIA (1980) Bobsled. Imperforate proof mounted on card from Format International Security Printers. Scott No 869, Yvert No 870. Lake Placid Olympics. 11472 EP LIBERIA (1980) Cross-country skiing. Imperforate proof mounted on card from Format International Security Printers. Scott No 870, Yvert No 871. Lake Placid Olympics. 11473 EP LIBERIA (1980) Speed skating. Imperforate proof mounted on card from Format International Security Printers. Scott No 871, Yvert No 872. Lake Placid Olympics. 11474 EP LIBERIA (1980) Ice hockey. Imperforate proof mounted on card from Format International Security Printers. Scott No 872, Yvert No 873. Lake Placid Olympics. 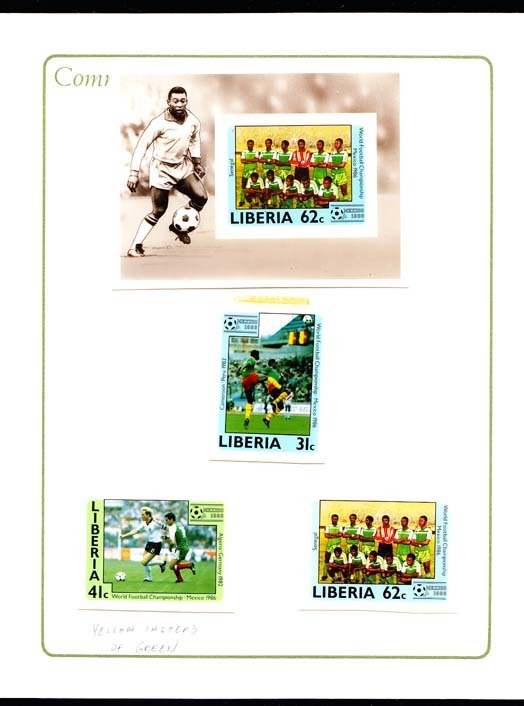 11475 EP LIBERIA (1980) Slalom. Imperforate proof mounted on card from Format International Security Printers. Scott No 873, Yvert No BF94. Lake Placid Olympics. 11622 EP LIBERIA (1980) Tie-dyed cloth. 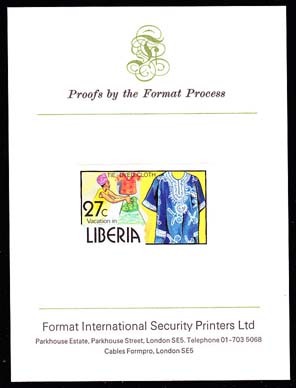 Imperforate proof mounted on Format International Security Printers card. Scott No 758, Yvert No 880. 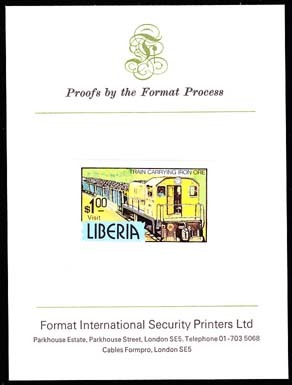 11669 EP LIBERIA (1980) Train carrying iron ore. Imperforate proof mounted on Format International Security Printers card. Scott No 760, Yvert No 881. 11859 EP LIBERIA (1980) Bridge on Mano River. President Tolbert (Liberia). President Stevens (Sierra Leone). Maps of Liberia & Sierra Leone. 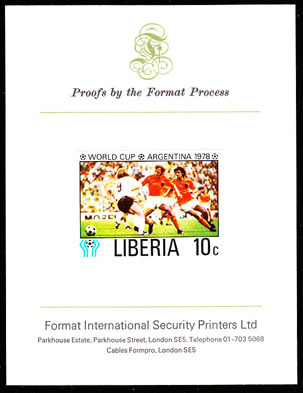 Imperforate proof mounted on Format International Security Printers card. Scott No 874, Yvert No 874. Mano River Union. 11860 EP LIBERIA (1980) Bridge on Mano River. President Tolbert (Liberia). President Stevens (Sierra Leone). Maps of Liberia & Sierra Leone. 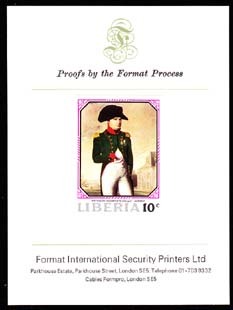 Imperforate proof mounted on Format International Security Printers card. Scott No 875, Yvert No 875. Mano River Union. 11861 EP LIBERIA (1980) Bridge on Mano River. President Tolbert (Liberia). President Stevens (Sierra Leone). Maps of Liberia & Sierra Leone. 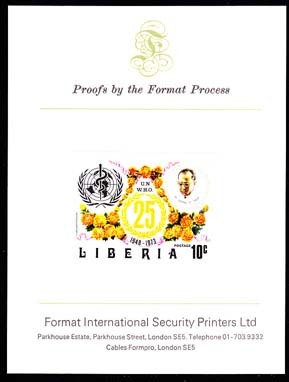 Imperforate proof mounted on Format International Security Printers card. Scott No 876, Yvert No 876. Mano River Union. 11862 EP LIBERIA (1980) Bridge on Mano River. President Tolbert (Liberia). President Stevens (Sierra Leone). Maps of Liberia & Sierra Leone. 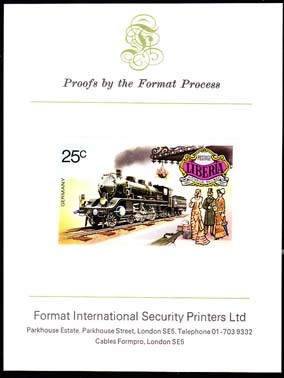 Imperforate proof mounted on Format International Security Printers card. Scott No 877, Yvert No 877. Mano River Union. 10523 EP LIBERIA (1981) Soldier. Citizens. Flag. Map of Liberia. Polaroid proof (See Note) of artwork. Scott No 881, Yvert No 884. 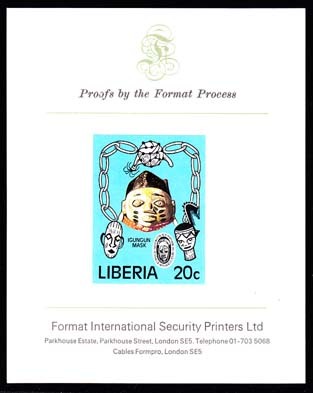 These proofs were Polaroid photographs of the original artwork that were sent by the printer (Format International) to the Liberian Philatelic Agency for their approval. 10524 EP LIBERIA (1981) Soldier. Citizens. Map of Liberia. 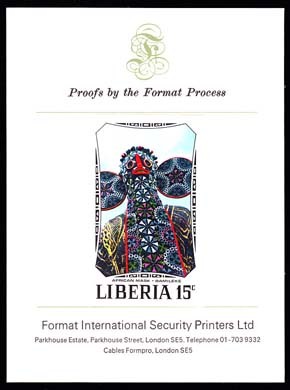 Imperforate proof mounted on Format International Security Printers card. Scott No 881, Yvert No 884. Establishment of New Government. 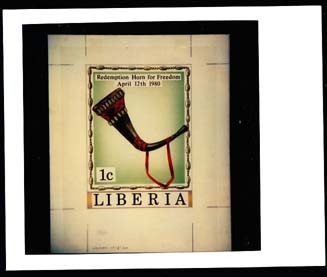 10832 EP LIBERIA (1981) Redemption horn. 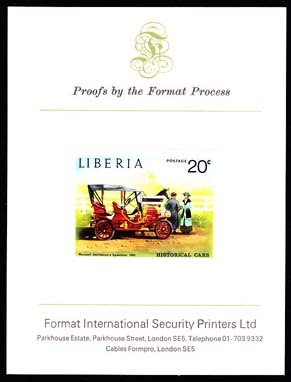 Imperforate proof mounted on Format International Security Printers card. Scott No 878, Yvert No 882. Establishment of New Government. 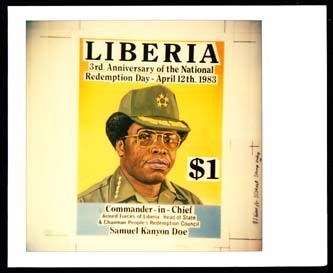 10833 EP LIBERIA (1981) Redemption horn. Polaroid proof (See Note) of artwork. Scott No 878, Yvert No 882. 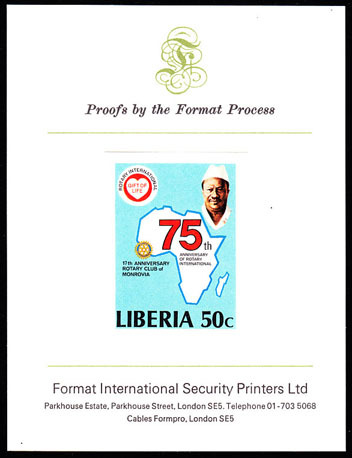 These proofs were Polaroid photographs of the original artwork that were sent by the printer (Format International) to the Liberian Philatelic Agency for their approval. 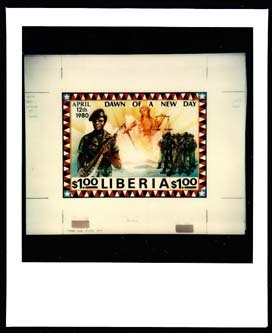 10860 EP LIBERIA (1981) Sgt. Doe. Citizens. Polaroid proof (See Note) of artwork. Scott No 893, Yvert No 892. 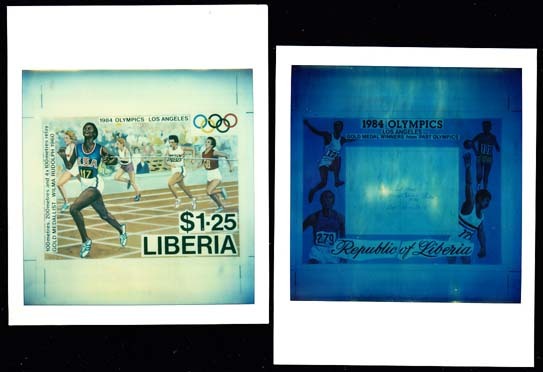 These proofs were Polaroid photographs of the original artwork that were sent by the printer (Format International) to the Liberian Philatelic Agency for their approval. 1st Anniversary of People's Redemption Council Government. 10861 EP LIBERIA (1981) First anniversary of Peoples Redemptive Council government. 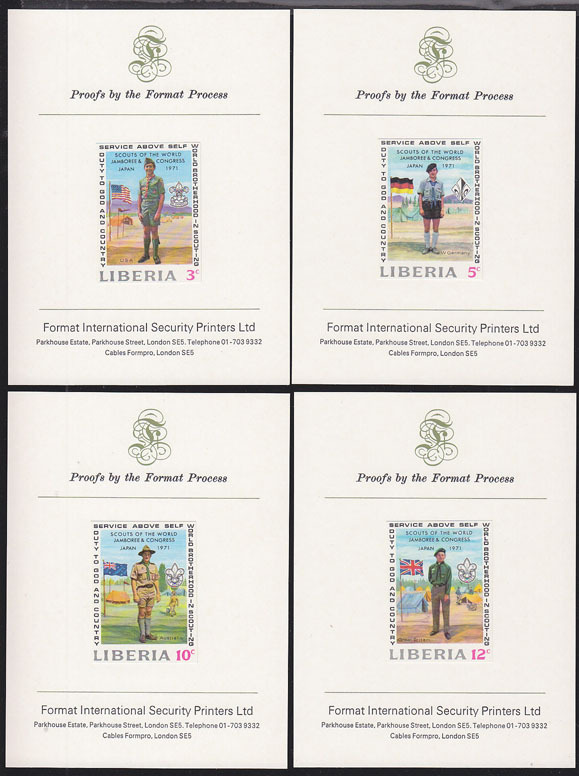 Set of 4 imperforate proofs mounted on Format International Security Printers card. Scott Nos 893-6, Yvert Nos 892-5. 10862 EP LIBERIA (1981) Sgt. Doe. Liberian flag. Polaroid proof (See Note) of artwork. Scott No 894, Yvert No 893. 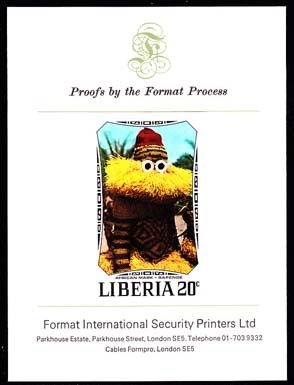 These proofs were Polaroid photographs of the original artwork that were sent by the printer (Format International) to the Liberian Philatelic Agency for their approval. 1st Anniversary of People's Redemption Council Government. 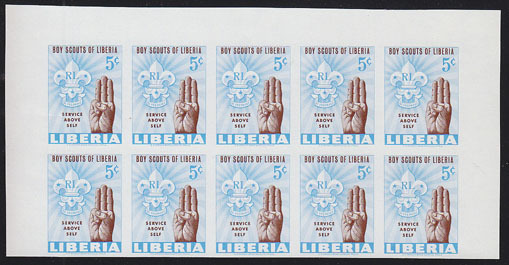 10863 EP LIBERIA (1981) Clasped arms. Polaroid proof (See Note) of artwork. Scott No 895, Yvert No 894. 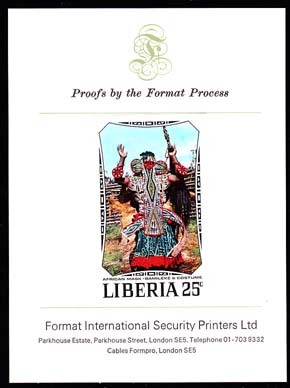 These proofs were Polaroid photographs of the original artwork that were sent by the printer (Format International) to the Liberian Philatelic Agency for their approval. 1st Anniversary of People's Redemption Council Government. 10864 EP LIBERIA (1981) Doe. Soldiers. 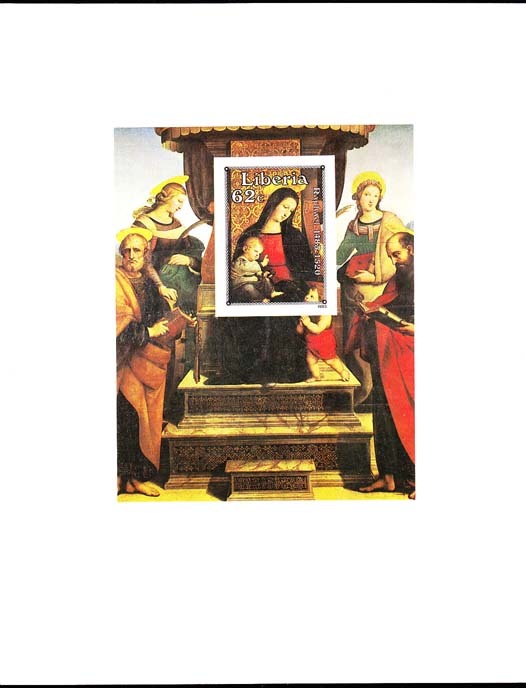 Allegory of Justice. Polaroid proof (See Note) of artwork. Scott No 896, Yvert No 895. 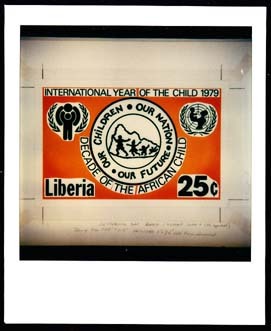 These proofs were Polaroid photographs of the original artwork that were sent by the printer (Format International) to the Liberian Philatelic Agency for their approval. 1st Anniversary of People's Redemption Council Government. 11084 EP LIBERIA (1981) Sgt. Doe. Clenched hands. Soldiers. Angel. Imperforate proof mounted on Format International Security Printers card. Scott No 880, Yvert No 883. Establishment of New Government. 11085 EP LIBERIA (1981) Sgt. Doe. Clenched hands. Angel. Polaroid proof (See Note) of artwork. Scott No 880, Yvert No 883. 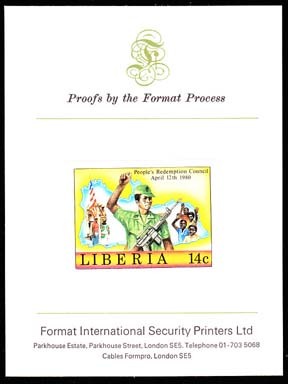 These proofs were Polaroid photographs of the original artwork that were sent by the printer (Format International) to the Liberian Philatelic Agency for their approval. 11499 EP LIBERIA (1981) Espana 82. Flags of 1930 & 1934 finalists. 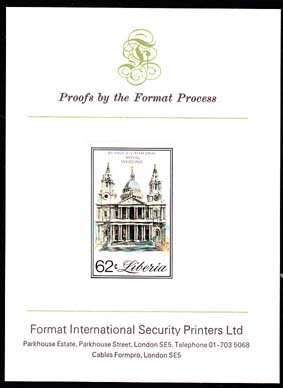 Imperforate proof mounted on card from Format International Security Printers. Scott No 886, Yvert No 886. 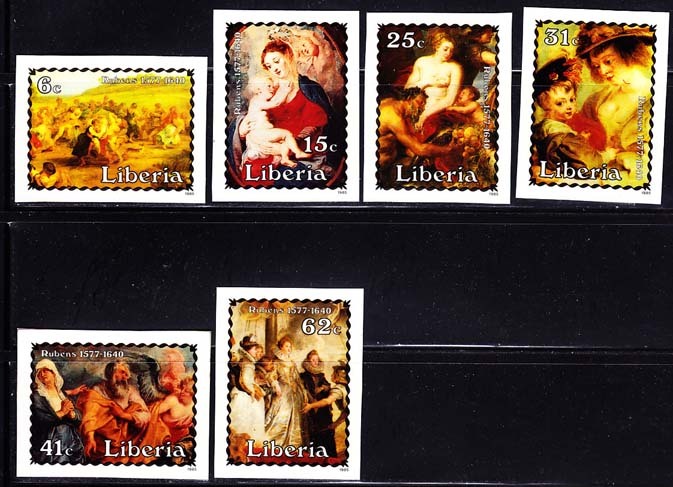 11500 EP LIBERIA (1981) Espana 82. Flags of 1938 & 1950 finalists. Imperforate proof mounted on card from Format International Security Printers. Scott No 887, Yvert No 887. 11501 EP LIBERIA (1981) Espana 82. Flags of 1954 & 1958 finalists. Imperforate proof mounted on card from Format International Security Printers. Scott No 888, Yvert No 888. 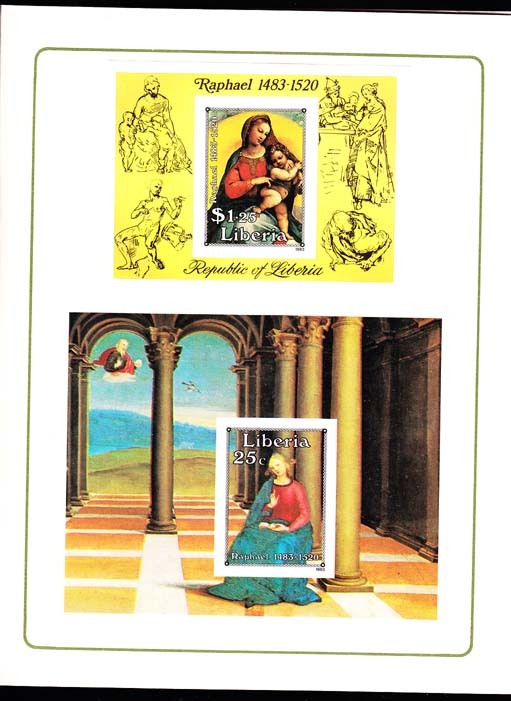 11502 EP LIBERIA (1981) Espana 82. Flags of 1962 & 1966 finalists. Imperforate proof mounted on card from Format International Security Printers. Scott No 889, Yvert No 889. 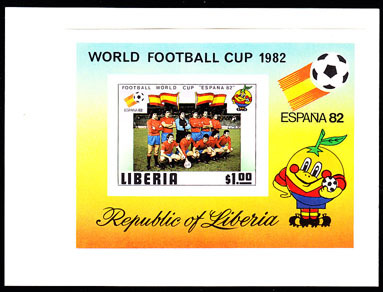 11503 EP LIBERIA (1981) Espana 82. Flags of 1970 & 1974 finalists. Imperforate proof mounted on card from Format International Security Printers. Scott No 890, Yvert No 890. 11504 EP LIBERIA (1981) Espana 82. Flags of 1978 finalists. Imperforate proof mounted on card from Format International Security Printers. Scott No 891, Yvert No 891. 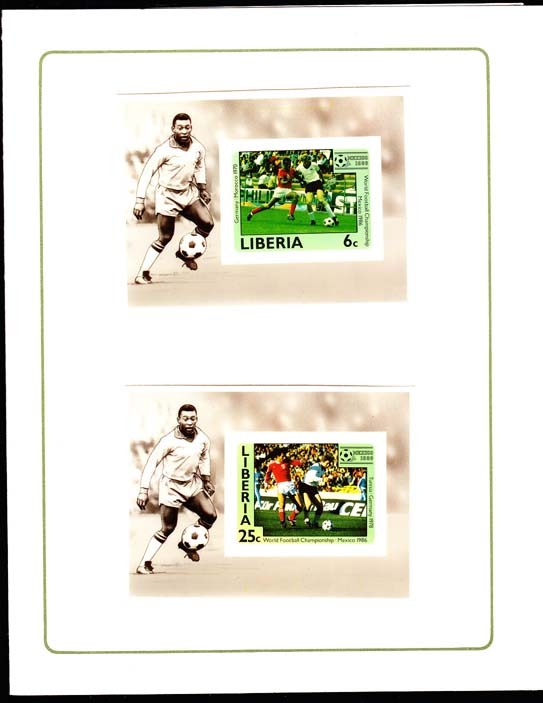 11505 EP LIBERIA (1981) Espana 82. Imperforate proof of S/S mounted on card from Format International Security Printers. Scott No 892, Yvert No BF95. 11829 EP LIBERIA (1981) Washington crossing Delaware river*. Imperforate proof of S/S with dimensions marked and stamp outlined in ink. Scott No 911, Yvert No BF96. 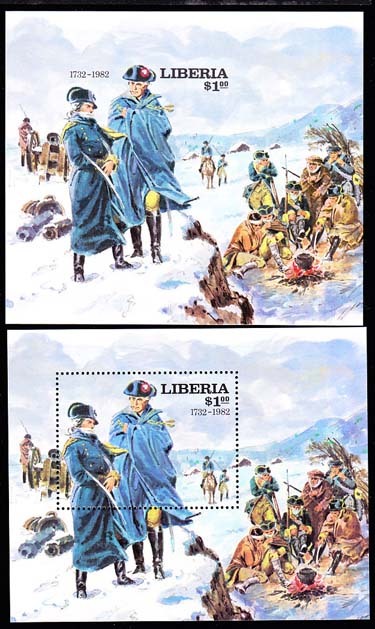 11830 EP LIBERIA (1981) Washington at Valley Forge*. Imperforate proof of S/S. Note that the issued S/S was cut down from this design, so portions of the design on the proof do not appear on the issued S/S. Scott No 922, Yvert No BF97. 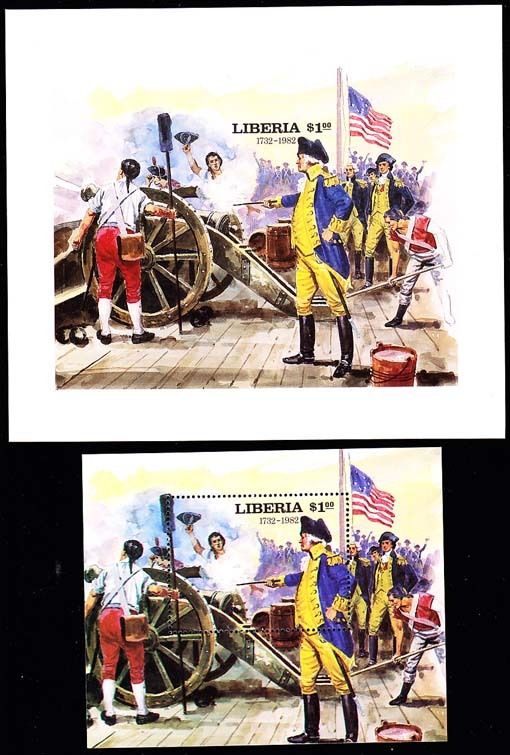 11831 EP LIBERIA (1981) Battle of Yorktown*. Imperforate proof of S/S. Note that the issued S/S was cut down from this design, so portions of the design on the proof do not appear on the issued S/S. Scott No 943, Yvert No BF99. 11935 EP LIBERIA (1981) Initials of Charles & Diana. Roses. 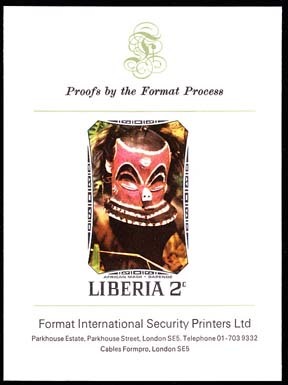 Imperforate proof mounted on Format International Security Printers card. Scott No 898, Yvert No 913. Royal Wedding. 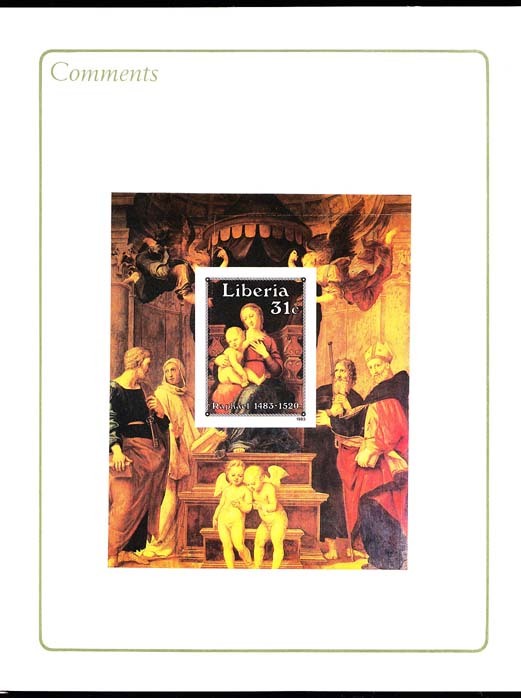 11936 EP LIBERIA (1981) St. Paul's Cathedral. 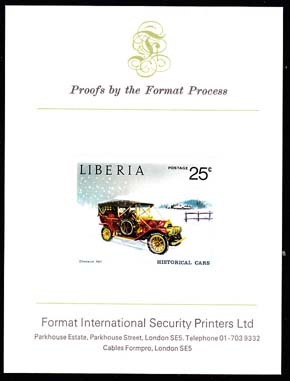 Imperforate proof mounted on Format International Security Printers card. Scott No 899, Yvert No 914. Royal Wedding. 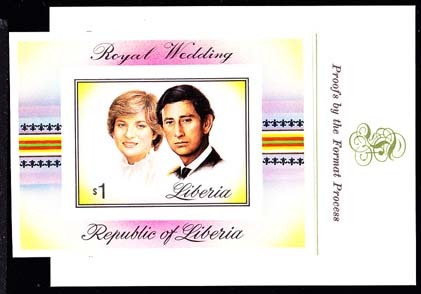 11937 EP LIBERIA (1981) Diana & Charles. 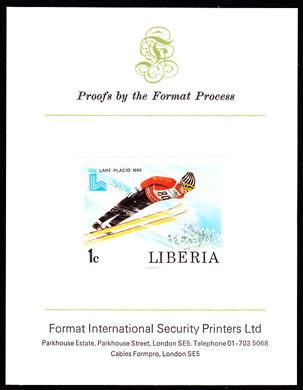 Imperforate proof of S/S mounted on Format International Security Printers card. Scott No 900, Yvert No BF97. Royal Wedding. 9028 EP LIBERIA (1982) Harvesting. 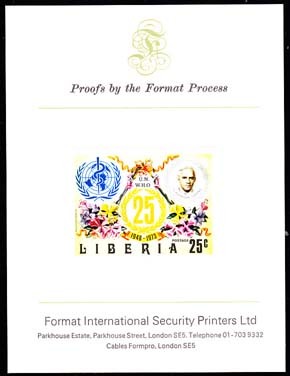 Imperforate proof mounted on Format International Security Printers card. Scott No 948, Yvert No 959. 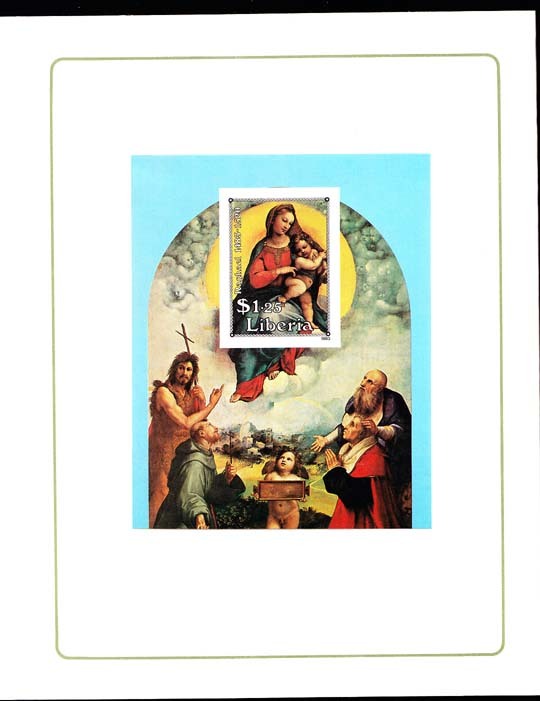 10070 EP LIBERIA (1982) Council of Examiners. Set of 2 cromalin proofs formerly mounted in Format International folder. Scott Nos 956-7, Yvert Nos 940-1. Glue has dried out resulting in the proofs becoming detached. Note that this does not affect the quality of the proofs. 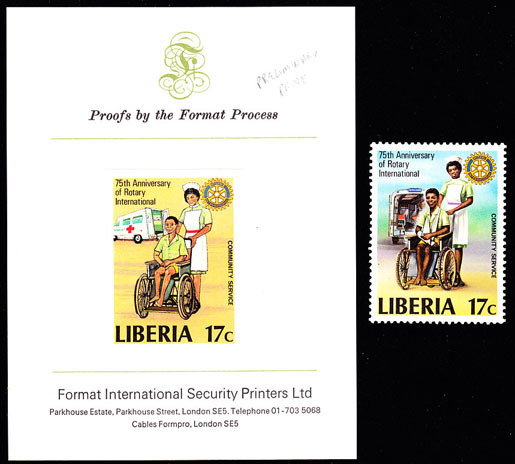 10356 EP LIBERIA (1982) International Year of the Disabled. Set of 2 cromalin proofs formerly mounted in Format International folder. Scott Nos 954-5, Yvert Nos 938-9. Glue has dried out resulting in the proofs becoming detached. Note that this does not affect the quality of the proofs. 11625 EP LIBERIA (1982) Tie-dyed cloth. 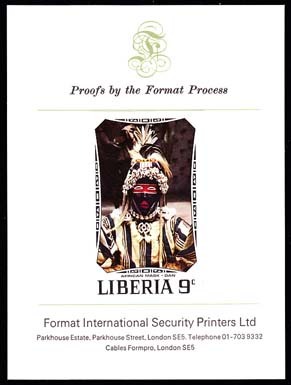 Imperforate proof mounted on Format International Security Printers card. Scott No 951, Yvert No 960. 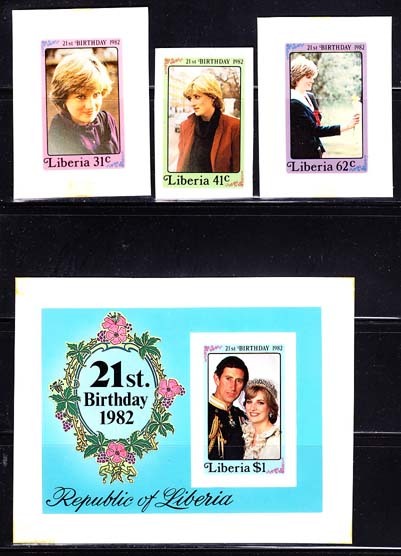 11940 EP LIBERIA (1982) Princess Diana. Wedding. 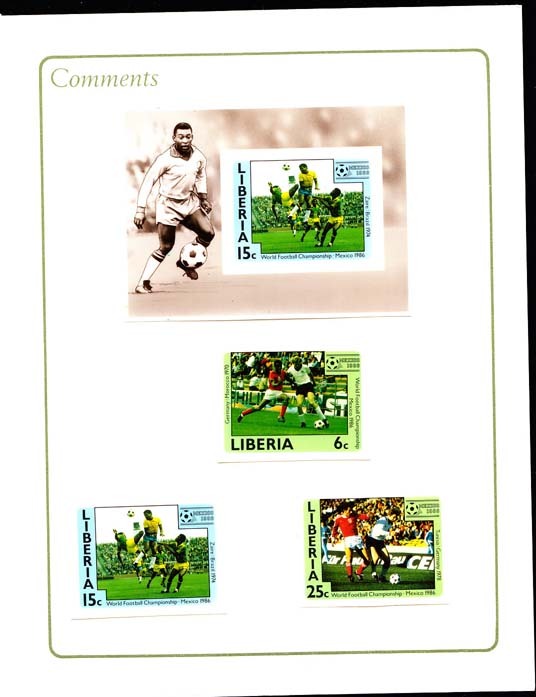 Set of 4 cromalin proofs formerly mounted in Format International folder. Scott Nos 958-61, Yvert Nos 912-14,BF97. Slight tape marks in margin where they were formerly attached to the folder. 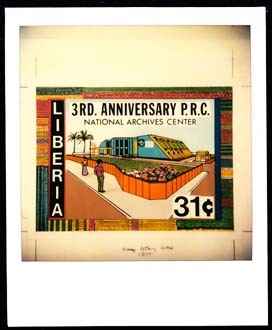 9433 EP LIBERIA (1983) National Archives Center. Polaroid proof (See Note) of artwork. Scott No 973, Yvert No 968. 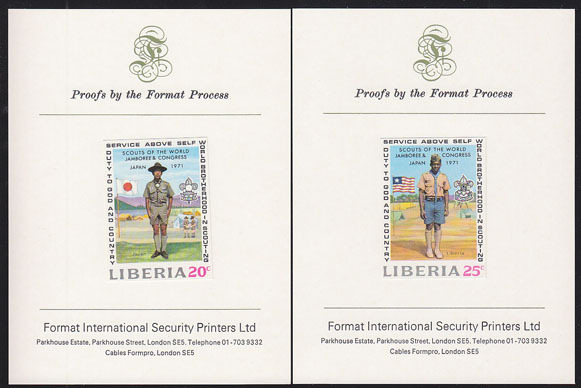 These proofs were Polaroid photographs of the original artwork that were sent by the printer (Format International) to the Liberian Philatelic Agency for their approval. 9434 EP LIBERIA (1983) National Archives Center. Polaroid proof (See Note) of artwork. Scott No 974, Yvert No 969. 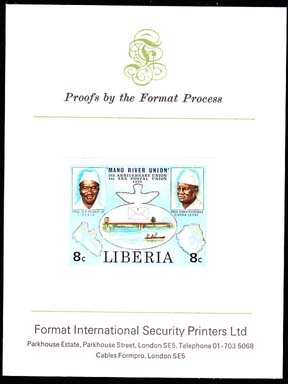 These proofs were Polaroid photographs of the original artwork that were sent by the printer (Format International) to the Liberian Philatelic Agency for their approval. 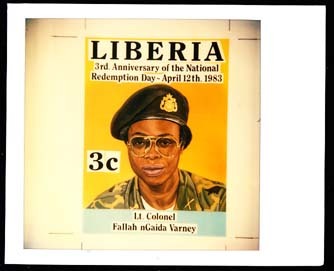 10866 EP LIBERIA (1983) Lt .Colonel Varney. Polaroid proof (See Note) of artwork. Scott No 966, Yvert No 962. 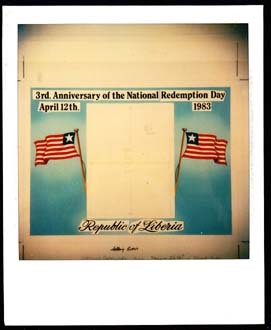 These proofs were Polaroid photographs of the original artwork that were sent by the printer (Format International) to the Liberian Philatelic Agency for their approval. 3rd Anniversary of National Redemption Day. 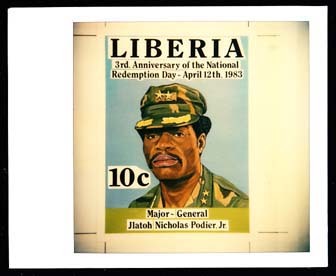 10867 EP LIBERIA (1983) Major General Podier. Polaroid proof (See Note) of artwork. Scott No 968, Yvert No 964. 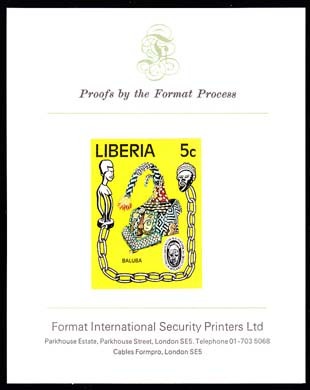 These proofs were Polaroid photographs of the original artwork that were sent by the printer (Format International) to the Liberian Philatelic Agency for their approval. 3rd Anniversary of National Redemption Day. 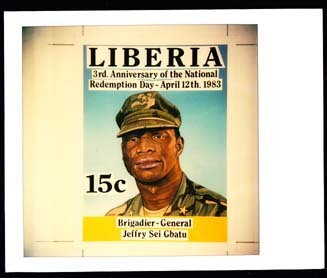 10868 EP LIBERIA (1983) Brigadier General Gbatu. Polaroid proof (See Note) of artwork. Scott No 969, Yvert No 965. 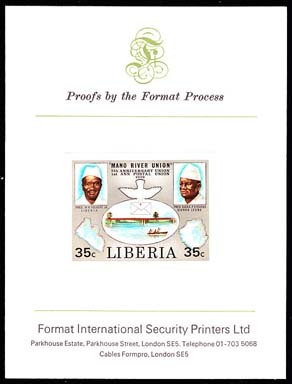 These proofs were Polaroid photographs of the original artwork that were sent by the printer (Format International) to the Liberian Philatelic Agency for their approval. 3rd Anniversary of National Redemption Day. 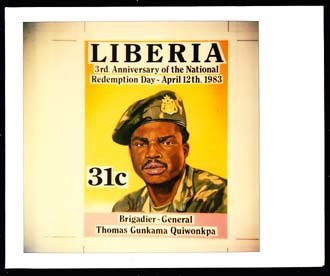 10869 EP LIBERIA (1983) Brigadier General Quiwonkpa. Polaroid proof (See Note) of artwork. Scott No 970, Yvert No 966. 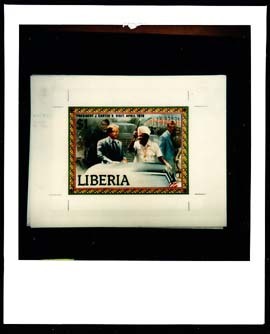 These proofs were Polaroid photographs of the original artwork that were sent by the printer (Format International) to the Liberian Philatelic Agency for their approval. 3rd Anniversary of National Redemption Day. 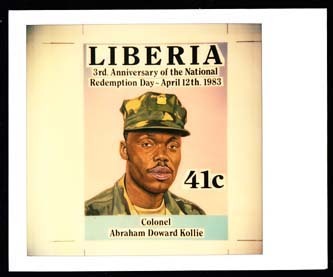 10870 EP LIBERIA (1983) Colonel Kollie. Polaroid proof (See Note) of artwork. Scott No 971, Yvert No 967. 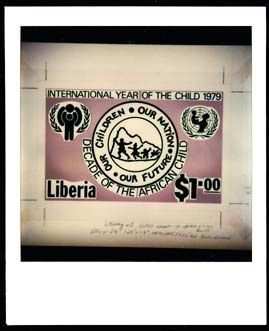 These proofs were Polaroid photographs of the original artwork that were sent by the printer (Format International) to the Liberian Philatelic Agency for their approval. 3rd Anniversary of National Redemption Day. 10872 EP LIBERIA (1983) CIC Doe. Polaroid proof (See Note) of artwork. Scott No 967, Yvert No 963. 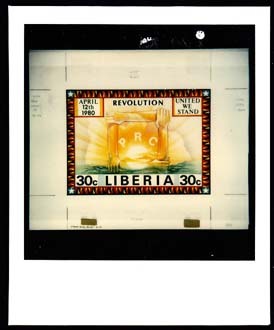 These proofs were Polaroid photographs of the original artwork that were sent by the printer (Format International) to the Liberian Philatelic Agency for their approval. 3rd Anniversary of National Redemption Day. 9486 EP LIBERIA (1984) Ganta-Harper highway construction. Polaroid proof (See Note) of artwork. Scott No 988, Yvert No 978. 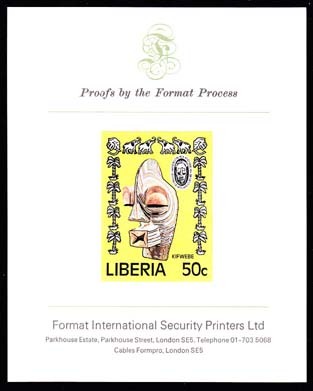 These proofs were Polaroid photographs of the original artwork that were sent by the printer (Format International) to the Liberian Philatelic Agency for their approval. 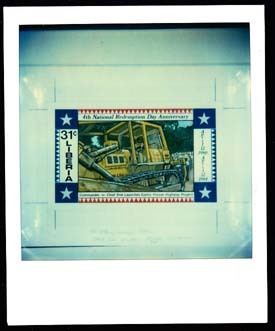 9487 EP LIBERIA (1984) Bulldozer. Highway construction. Polaroid proof (See Note) of artwork. Scott No 990, Yvert No 980. 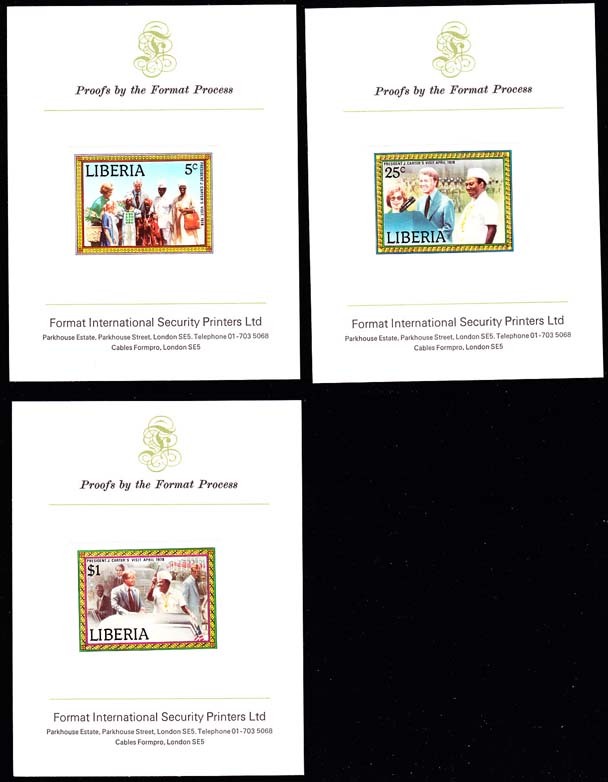 These proofs were Polaroid photographs of the original artwork that were sent by the printer (Format International) to the Liberian Philatelic Agency for their approval. 9892 EP LIBERIA (1984) Indigent Children's Home. Mrs. Doe. Polaroid proof (See Note) of artwork. Scott No 1013, Yvert No 1005. 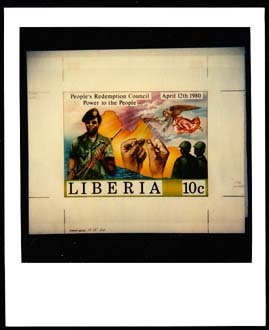 These proofs were Polaroid photographs of the original artwork that were sent by the printer (Format International) to the Liberian Philatelic Agency for their approval. 9893 EP LIBERIA (1984) Home for indigent children. Set of 2 cromalin proofs mounted in Format International folder. Scott Nos 1013-4, Yvert Nos 1005-6. 9894 EP LIBERIA (1984) Indigent Children's Home. Mrs. Doe. Polaroid proof (See Note) of artwork. Scott No 1014, Yvert No 1006. 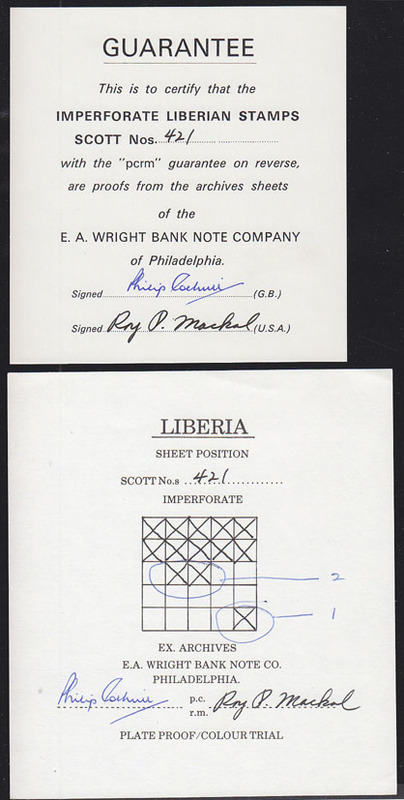 These proofs were Polaroid photographs of the original artwork that were sent by the printer (Format International) to the Liberian Philatelic Agency for their approval. 10123 EP LIBERIA (1984) Shore birds. Container ship. Fish. Ore train. Set of 4 cromalin proofs formerly mounted in Format International folder. Scott Nos 1005-8, Yvert Nos 997-1000. Louisiana Expo.. Glue has dried out resulting in the proofs becoming detached. Note that this does not affect the quality of the proofs. 10481 EP LIBERIA (1984) Constitutional Assembly. Polaroid proof (See Note) of artwork. Scott No 989, Yvert No 979. 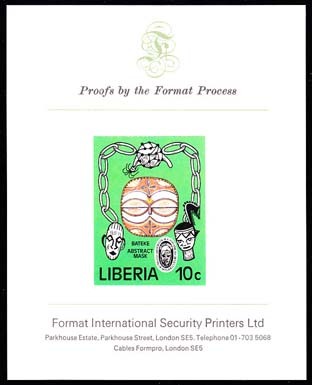 These proofs were Polaroid photographs of the original artwork that were sent by the printer (Format International) to the Liberian Philatelic Agency for their approval. 10482 EP LIBERIA (1984) Draft constitution presentation. Polaroid proof (See Note) of artwork. Scott No 991, Yvert No 981. 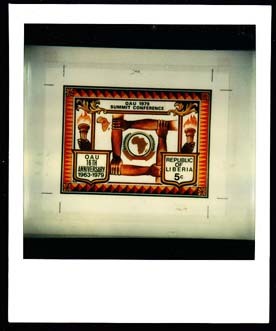 These proofs were Polaroid photographs of the original artwork that were sent by the printer (Format International) to the Liberian Philatelic Agency for their approval. 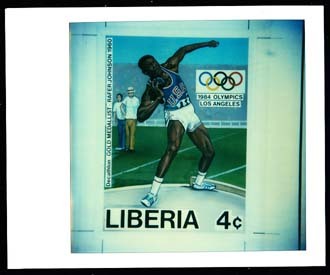 11444 EP LIBERIA (1984) Rafer Johnson (shot put). Polaroid proof (See Note) of artwork. Los Angeles Olympics. Scott No 1000, Yvert No 992. 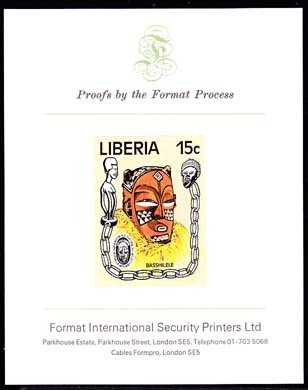 These proofs were Polaroid photographs of the original artwork that were sent by the printer (Format International) to the Liberian Philatelic Agency for their approval. 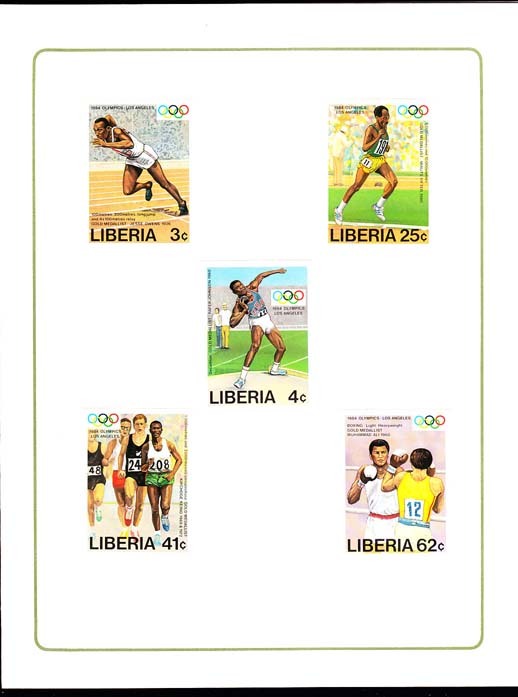 11446 EP LIBERIA (1984) Wilma Rudolph. Set of 2 polaroid proofs of artwork vignette and frame of S/S. Los Angeles Olympics. Scott No 1004, Yvert No BF107. 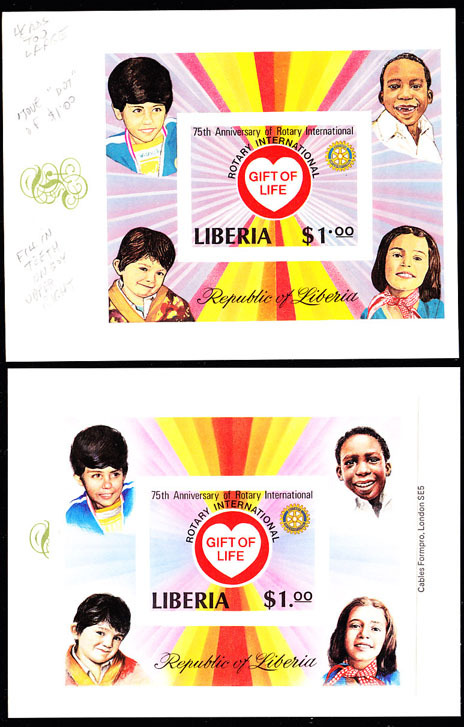 These proofs were Polaroid photographs of the original artwork that were sent by the printer (Format International) to the Liberian Philatelic Agency for their approval. 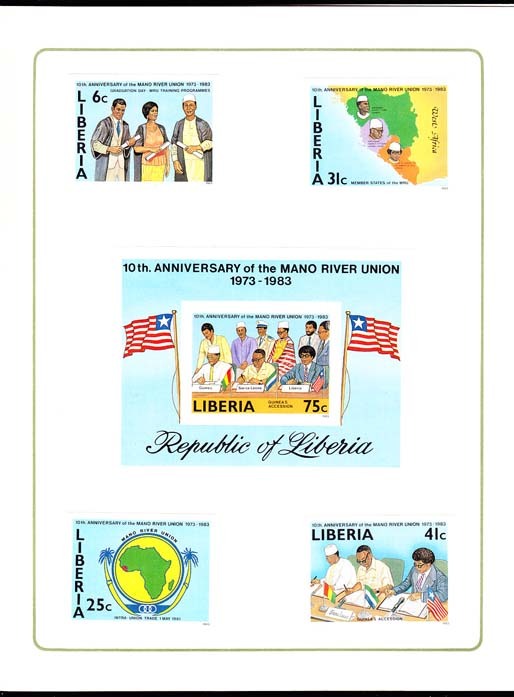 11863 EP LIBERIA (1984) Mano River Union. Set of 5 cromalin proofs mounted in Format International folder. Scott Nos 982-6, Yvert Nos 982-5,BF105. 11967 EP LIBERIA (1984) Pygmy hippopotamus and baby. WWF emblem. Polaroid proof (See Note) of artwork. Scott No 1009, Yvert No 1001. 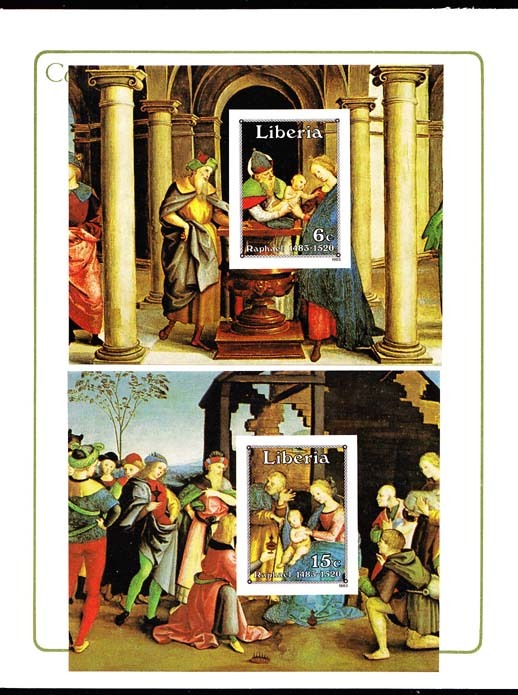 These proofs were Polaroid photographs of the original artwork that were sent by the printer (Format International) to the Liberian Philatelic Agency for their approval. 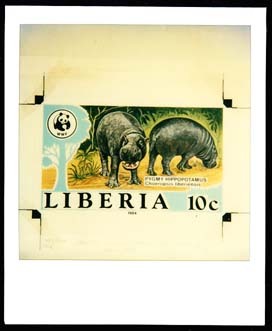 11968 EP LIBERIA (1984) Two pygmy hippopotamuses. WWF emblem. Polaroid proof (See Note) of artwork. Scott No 1010, Yvert No 1002. 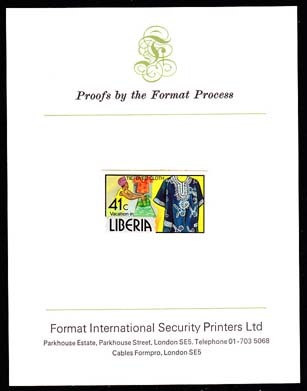 These proofs were Polaroid photographs of the original artwork that were sent by the printer (Format International) to the Liberian Philatelic Agency for their approval. 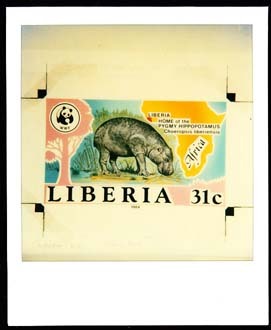 11969 EP LIBERIA (1984) Front of pygmy hippopotamus. WWF emblem. Polaroid proof (See Note) of artwork. Scott No 1011, Yvert No 1003. 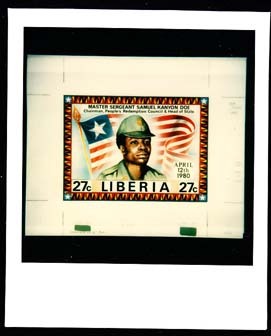 These proofs were Polaroid photographs of the original artwork that were sent by the printer (Format International) to the Liberian Philatelic Agency for their approval. 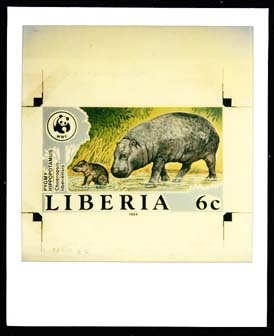 11970 EP LIBERIA (1984) Pygmy hippopotamus. WWF emblem. Polaroid proof (See Note) of artwork. Scott No 1012, Yvert No 1004. 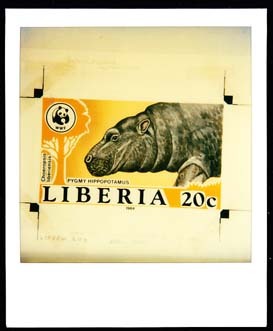 These proofs were Polaroid photographs of the original artwork that were sent by the printer (Format International) to the Liberian Philatelic Agency for their approval. 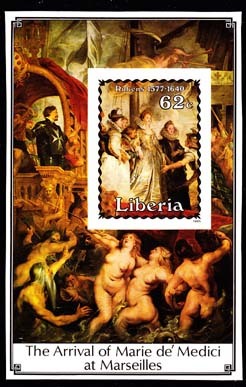 9313 EP LIBERIA (1985) Paintings by Rubens. Set of 6 cromalin proofs of unissued stamps formerly mounted in Format International folder. 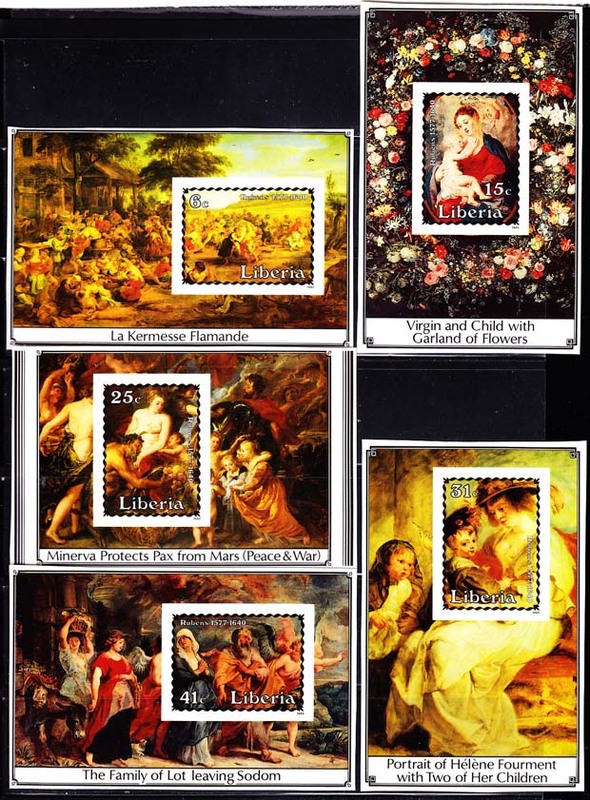 The titles are "La Kermesse Flamande", "Virgin and Child withGarland of Flowers", "Minerva protects Pax from Mars", "Portrait of Hélène Fourment", "Family of Lot Leaving Sodom" and "The Arrival of Marie de Medici at Marseilles". Glue has dried out resulting in the proofs becoming detached. Note that this does not affect the quality of the proofs. 9683 EP LIBERIA (1985) Audubon drawings of birds. Set of 6 cromalin proofs formerly mounted in Format International folder. Scott Nos 1017-22, Yvert Nos 1009-14. Glue has dried out resulting in the proofs becoming detached. Note that this does not affect the quality of the proofs. 10873 EP LIBERIA (1985) Barracks. Pan-Afircan Plaza. Set of 2 cromalin proofs formerly mounted in Format International folder. Scott Nos 1015-6, Yvert Nos 1007-8. Glue has dried out resulting in the proofs becoming detached. Note that this does not affect the quality of the proofs. 11805 EP LIBERIA (1985) Women planting rice. Wheat. Soybeans. Pineapple. Mushrooms. Set of 2 cromalin proofs mounted in Format International folder. Scott Nos 1041-2, Yvert Nos 1030-1. 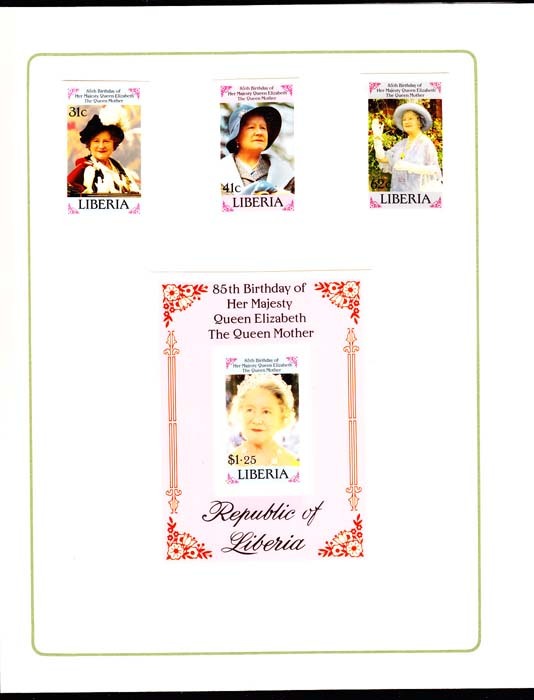 11941 EP LIBERIA (1985) Queen Mum 85th birthday. Set of 4 cromalin proofs mounted in Format International folder. Scott Nos 1037-40, Yvert Nos 1027-9,BF109. 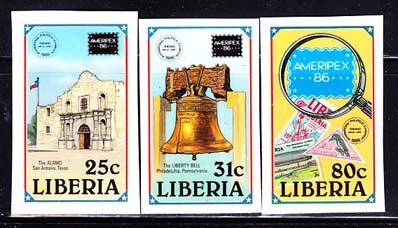 11562 EP LIBERIA (1986) Alamo. Liberty Bell. Stamps. AMERIPEX. Set of 3 cromalin proofs formerly mounted in Format International folder. Scott Nos 1043-5, Yvert Nos 1032-4. Glue has dried out resulting in the proofs becoming detached. Note that this does not affect the quality of the proofs.